SERVPRO of Society Hill specializes in commercial building damages and some may be caused by storms. Here is a photo of a flood that was caused by a storm damage and water started pouring in. Our crews came in and extracted all the water and set up dehumidifiers and fans to dry the structure. After a short three days of work everything was dry and ready for repairs thanks to our speedy team. Taking on all Bursting Pipes! Bursting or leaking pipes is one of the most common ways that houses get water damage. Drains and toilets that get backed up and blocked can cause undue pressure in the pipe, which then causes it to burst or leak. Garbage disposals that aren’t working properly are another common reason for pipes to burst, as are roots that grow in the yard into the sewer lines. Old or rusty pipes are also more prone to leaking. If your pipes do burst and cause water damage call SERVPRO Society Hill. They will come and fix the damage fast and efficiently, so everyone can get back to there regular lives. SERVPRO Society Hill will make sure that the room looks like it did before the water damage happened. Our team at SERVPRO of Society Hill is not just a bunch of hired help. 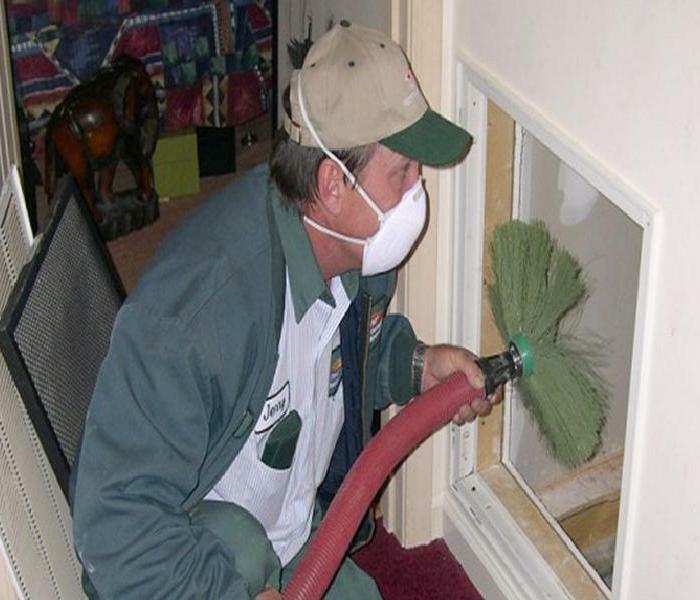 We have a staff that is highly trained in property damage restoration and cleaning. With technology constantly changing, and more efficient products always being shipped out. It is important for the trained professionals at SERVPRO of Society Hill to always be one step ahead. We know how stressful any disaster can be. That's why right from the start we let all of our customers know how everything is going to be handled, and step by step updates. It is our job to leave your disaster "Like it never even happened." 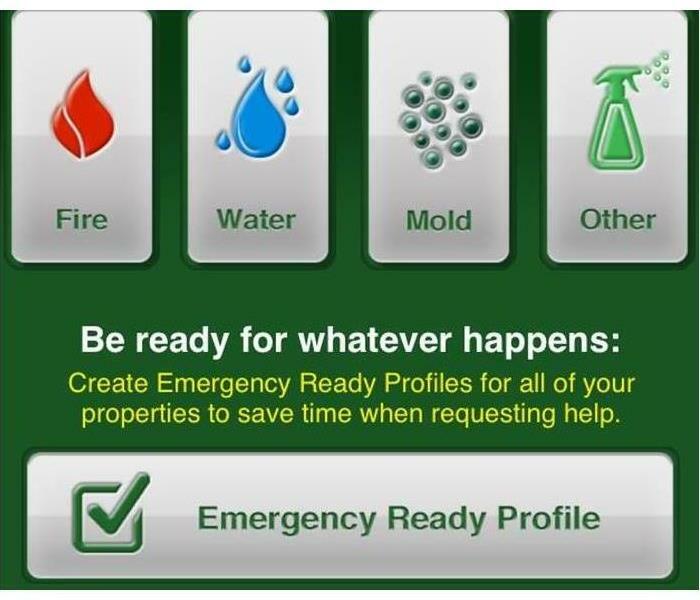 What is an ERP you ask, well it stands for Emergency Ready Profiles. These are very beneficial to property manager and building engineers in large commercial buildings. Having a ready plan in place can save your business and building. A trained professional from SERVPRO of Society Hill will walk through your building with you and fill out all the information needed. After completion all you have to do is download an App on your phone or tablet, and you have all the information one click away. Paper versions are also available. These ERP's come in handy when an emergency occurs and someone not familiar with the building needs important information. Changes and updates can always be made through the App whenever they may occur. This is all done at no charge to you or your building. Knowing what to do and what to expect in advance is the key to timely mitigation and can help minimize how water and fire damage can affect your business. Taking on Jobs of Any Size,and at Any Location! There is no job to small or big for SERVPRO of Society Hill. From small residential homes to large city commercial buildings. Once we get the call it is go time. As you can see in this picture we had a water damage at a residential home on a small street filled with cars. That would not stop our trained professionals from making it work and getting the equipment there no matter the circumstances. We offer the best price along with the best advise. Not only always doing the most officiant work, but never doing extra to raise prices. You can always trust on SERVPRO of Society Hill for a speedy response, followed by unmatched work. 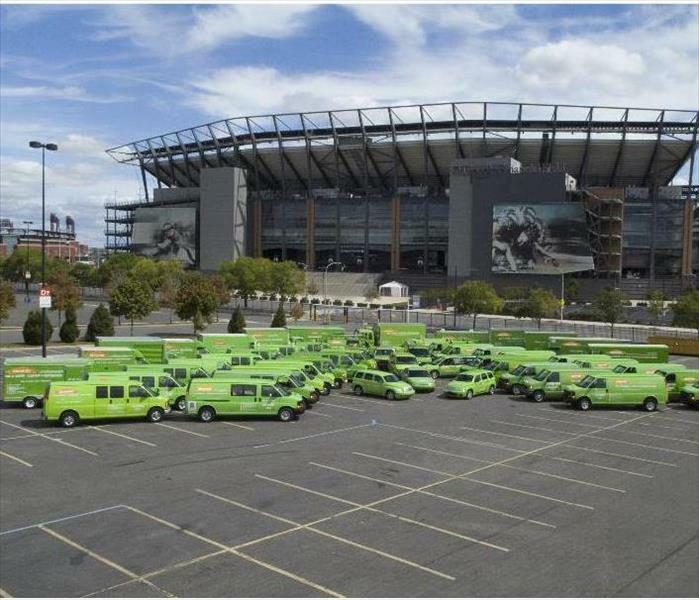 SERVPRO of Society Hill appreciates all the time and hard work the first responders put into the city of Philadelphia. That's why we like to reach out and offer cases of water to all of those that put there life on the line everyday. Not only for the community but for SERVPRO of Society Hill as well. Making sure that the work environment we are going into is safe enough. Not only do we serve the customers that call us, we look after the ones that keep us safe and also provide us with work. Here we have a small fire damage that was caused by a heater that was placed to close to the wall. Left unattended the wall got so hot that it eventually ignited. Luckily the homeowner did notice the fire rather quickly before, and was able to extinguish it before it did serious damage. Although it may look like a small job the smoke, soot, and odor can cause other issues. SERVPRO of Society Hill responded to the cleanup call within 2 hours. After removing fire damaged area of the wall soot removal was next. Using special cleaning sponges the soot was cleaned off of the surrounding walls. 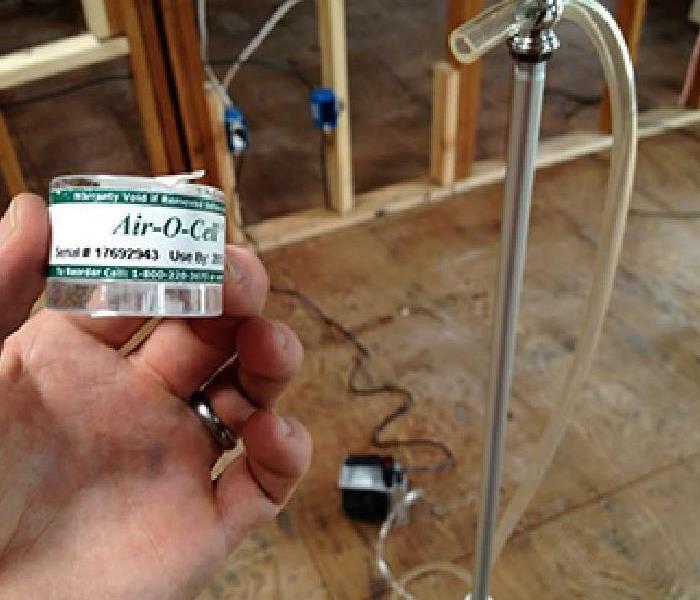 The final step was using a ozone machine to remove the smoke odor throughout the house. 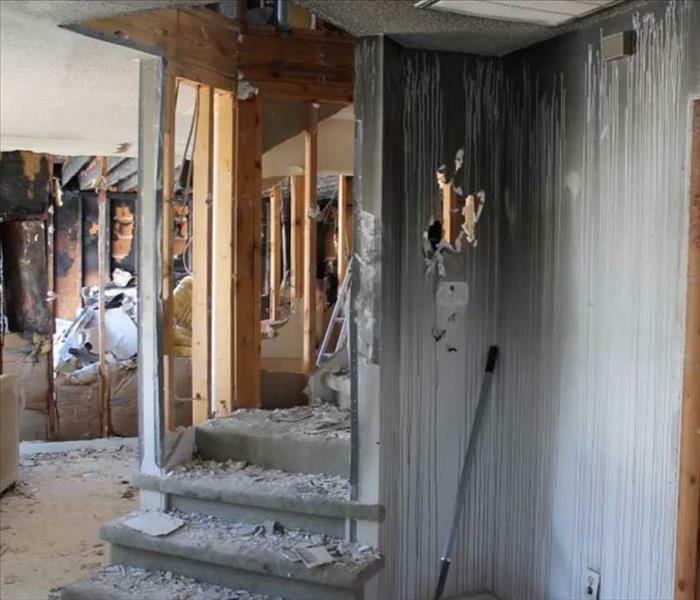 After a few days of the ozone treatment and the wall repaired, SERVPRO of Society Hill had the fire damage looking "Like it never even happened." Always be mindful of where you place your space heaters, as well to not leave them unattended. 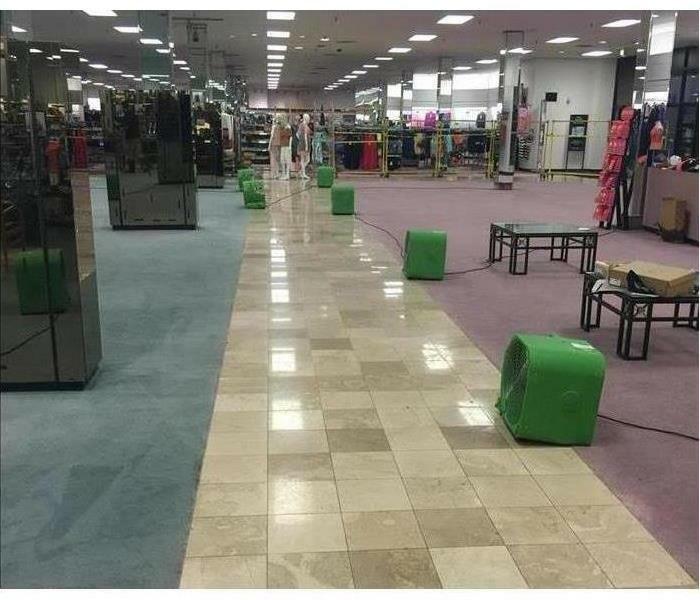 This department store flooded after a pipe on the floor above burst sending a deluge of water to the store below. Dangerous conditions forced the store to close until the problem was fixed. 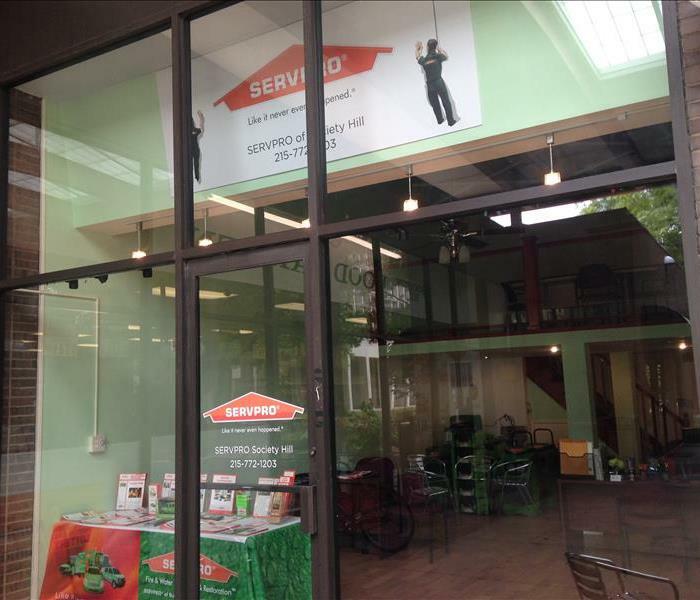 Knowing that they were losing money the longer the store remained closed SERVPRO of Society Hill was contacted to fix the damages. Responding swiftly to the call SERVPRO of Society Hill was able to assemble the crew and equipment needed. Moving all the products out of harms way they were than able to extract the water. After all the standing water was removed the dryers were set in place. After a two day period the floors were completely dried and the store was able to re-open. It is crucial as a business to reach out as soon as possible when a disaster strikes so that money is not lost from being shut down. After a winter storm whipped through bringing howling winds and driving snow. This large part of a tree snapped and crashed through this home. Thankfully no one was hurt, but the home did take a big hit. With the temperatures in the teens and a large hole in the house, these people needed help fast. SERVPRO of Society Hill responded to the call immediately and began clearing all debris from the area. After the tree was removed the inside damages were taken care of along with all debris inside removed. Finally the roof was reconstructed and the house was safe to live in once again. The homeowners were pleased with how fast SERVPRO of Society Hill responded and were able to get the damage cleaned up! Here we have just a small sample of the mold that was growing behind a homes drywall. 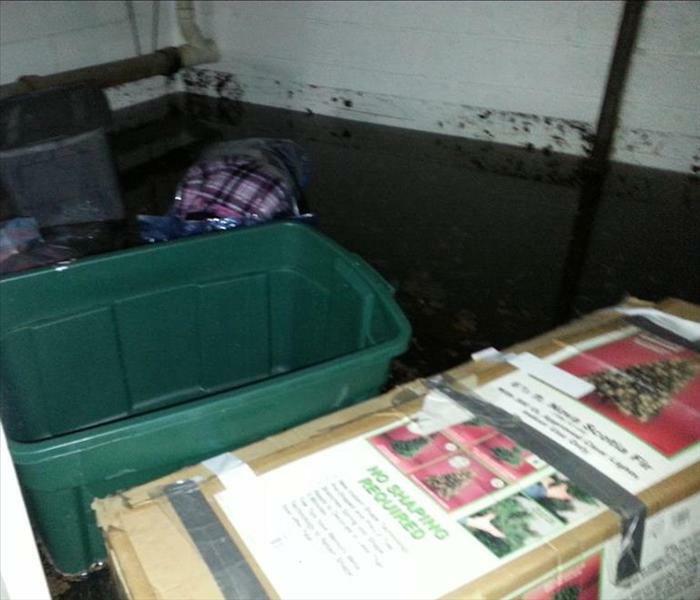 This was discovered by SERVPRO of Society Hill after a call came in for a basement flood from a over flowing toilet. 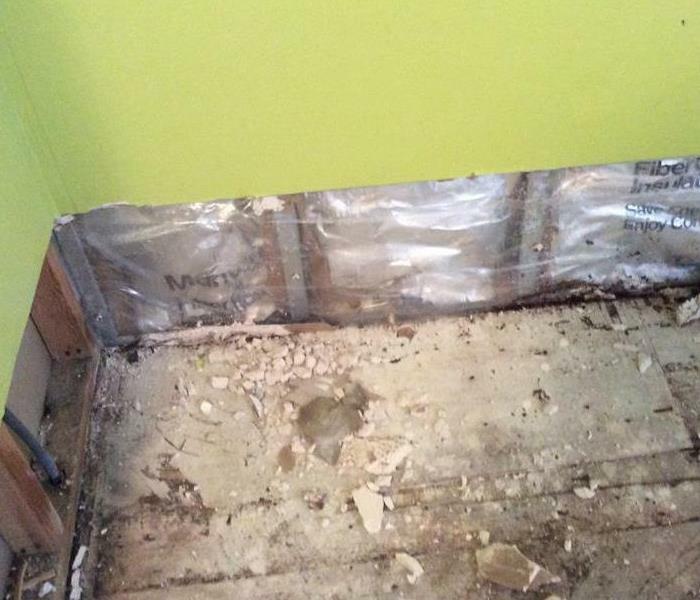 After much of the drywall was removed from water damage, is when the mold problem was revealed. While some of it may have been from the recent damage the amount of mold that was found was from past issues as well. Being that it was in the basement also makes it harder to detect, because of the musky smell the basement already has. 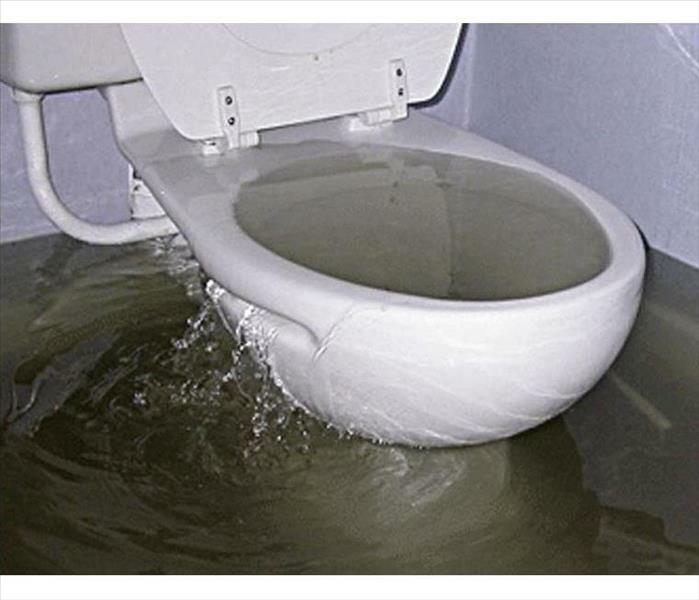 It is very important to make sure after any water damage that all areas are completely dry. Mold is not always going to be in direct sight but it can cause serious health issues if not taken care of. SERVPRO of Society Hill was able to remove all the areas affected by the mold, and made sure the basement was properly dried. Also making sure that there was not an on going issue that was leading to the mold. 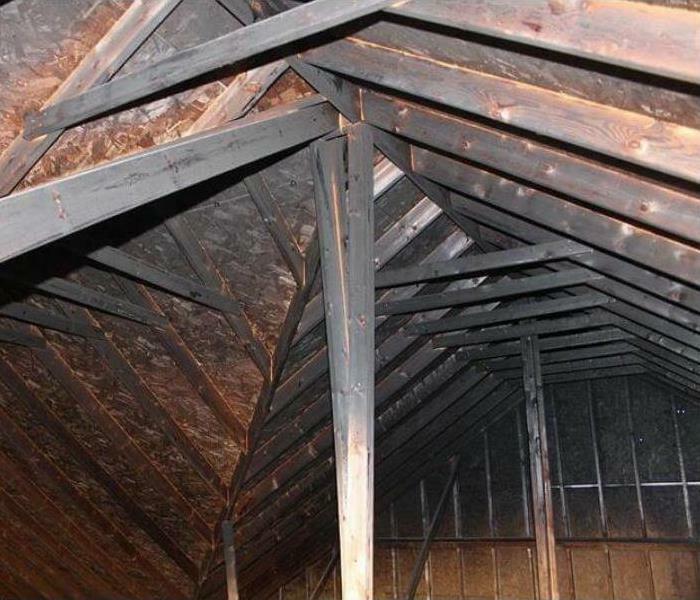 This imagine shows severe fire damage throughout a the attic of a home after an electrical spark. As you can see the beams are covered in soot and charred wood. Smoke damage is also clearly seen. Not only is this dangerous to the structure possibly collapsing, but post a health threat if not taken care or quickly. 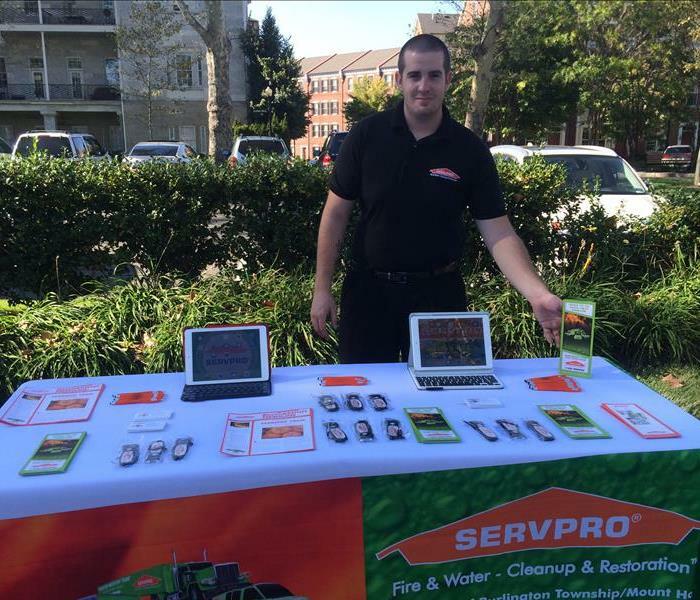 SERVPRO of Society Hill was contacted to handle the fire damage cleanup after the blaze was put out. Luckily for this home the wood just needed to be scrubbed rather than replaced. Using special sponges and chemicals the wood was left looking soot free. Air scrubbers were than brought in, and the deodorization process than took place. After 4 days or combined cleaning and odor removal SERVPRO of Society Hill left the attic looking "Like it never even happened." Freezing Temperatures and Bursting Pipes! Here we have a shocking picture of what happens when I pipe bursts in below zero temperatures. This was located in the basement of a home that did not have any heat circulation. An older pipe located above the sink burst while the homeowner was away for the night. Water rained down and over night just began to freeze on the floor and build up around the sink. 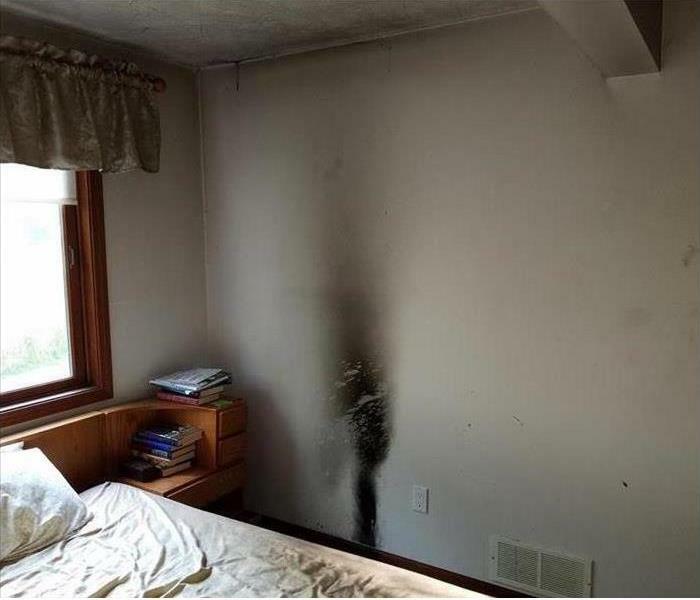 This was the result when the homeowner arrived home the next morning. Once the water was shut of SERVPRO of Society Hill was called out for this emergency. Any damage and build up of ice was cleared up in a days time. Although this is rare, if temperatures are cold enough it can happen! 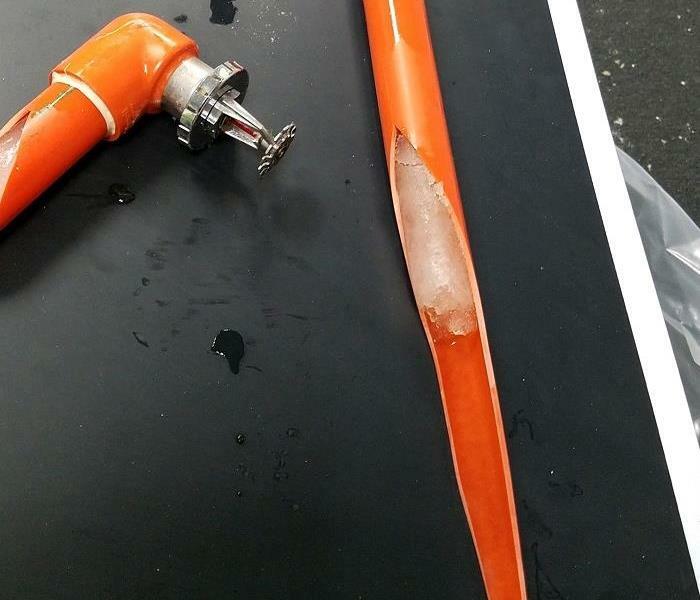 Always make sure to monitor pipes when temperatures get extremely cold to prevent anything like this from happening. 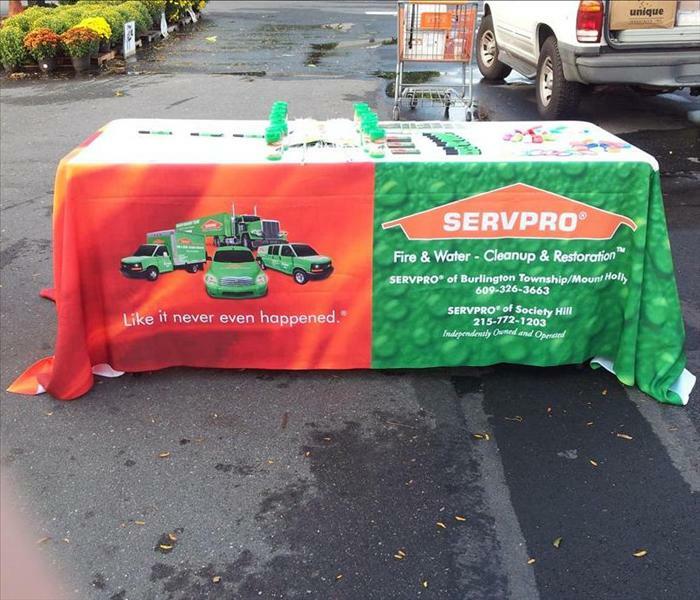 Always remember SERVPRO of Society Hill can handle any job thrown our way! 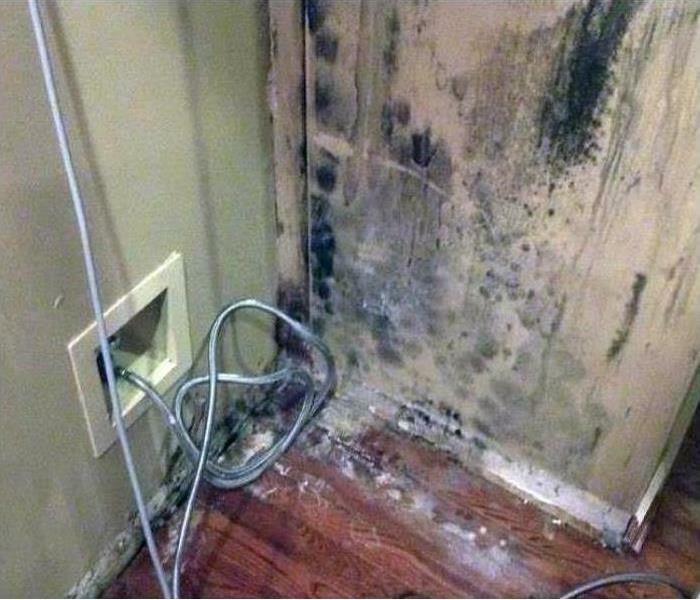 This mold damage was found when a homeowner returned home after being away for a month on a business trip. 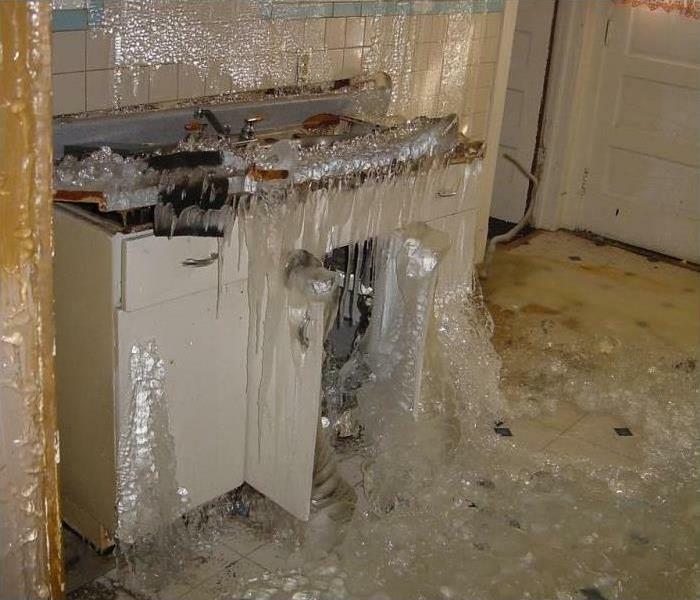 He had forgotten to shut his water off before leaving, and due to extreme cold weather a frozen pipe had burst. Not only was there water damage, but as you can see mold began to grow as well. SERVPRO of Society Hill was called out to deal with the damages. The water was extracted followed by mold remediation. Unfortunately with the issue being discovered a few weeks after the incident the mold growth was severe. The ceiling needed to be removed and replaced. 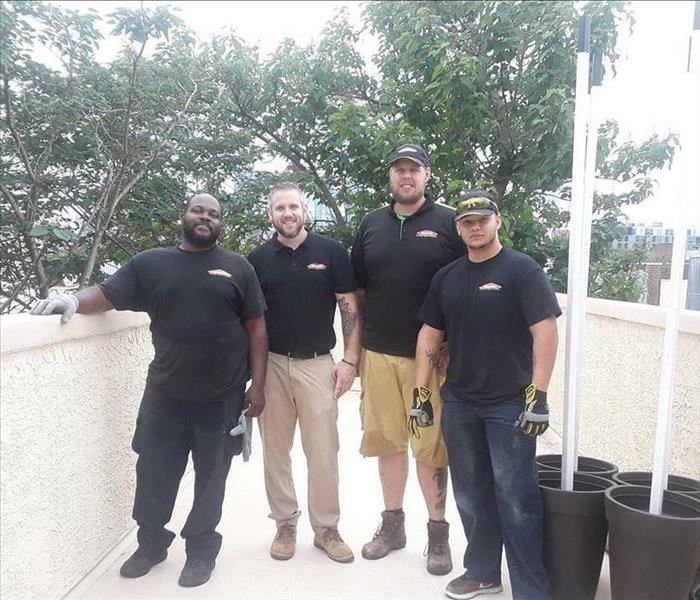 After all the demolition and ceiling replacement, SERVPRO of Society Hill took the proper procedures to make sure the home was clear of all mold physically, as well as in the air. It is very important when leaving you home for an extended period of time to shut off your water. Doing it will save you a lot of pain and struggle as well as money. 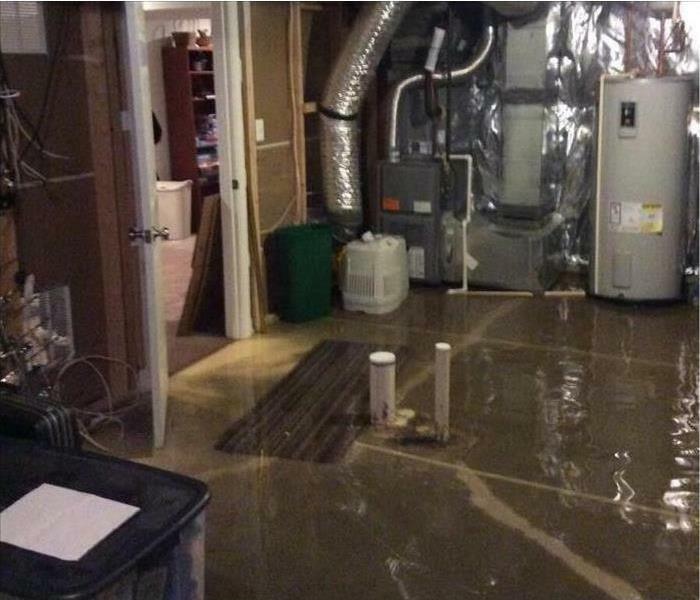 The result of this flooded basement was caused after a old hot water heater gave way leaving water all over the basement. SERVPRO of Society Hill was quick to the scene after receiving the frantic call from the residential home. The 2 inches of water throughout the basement was extracted in a short period of time. Whatever could be saved and restored was put to the side. While all damaged contents were removed to be disposed properly. After a plumber replaced the old hot water heater SERVPRO could then begin drying all the surfaces affected by the water. Working swiftly to begin the drying process is important, so that mold growth does not begin. The drying out took about 2 days to fully dry, and there not a damp spot to be found. Unfortunately these accidents happen to everyone. That's why it's important to contact SERVPRO of Society Hill as soon as disaster hits. 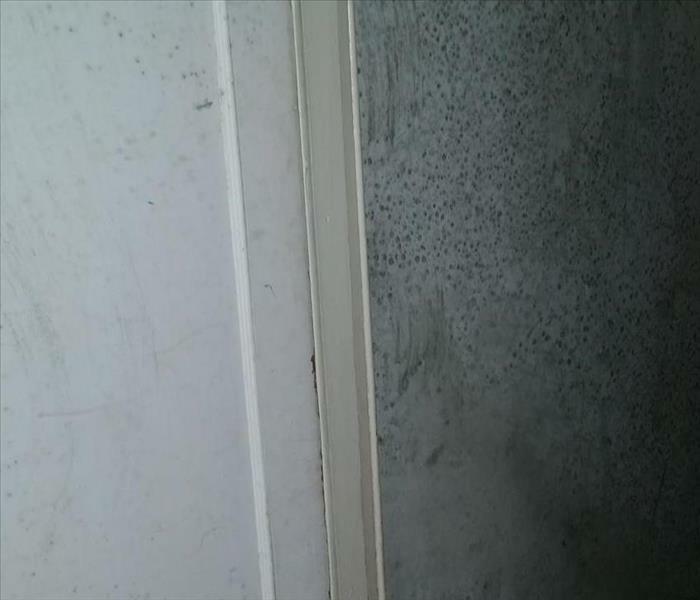 This picture shows significant mold growth on a wall in a residential home. The cause of the mold growth is because, a water line running to a freezer broke sending water shooting all over the wall. 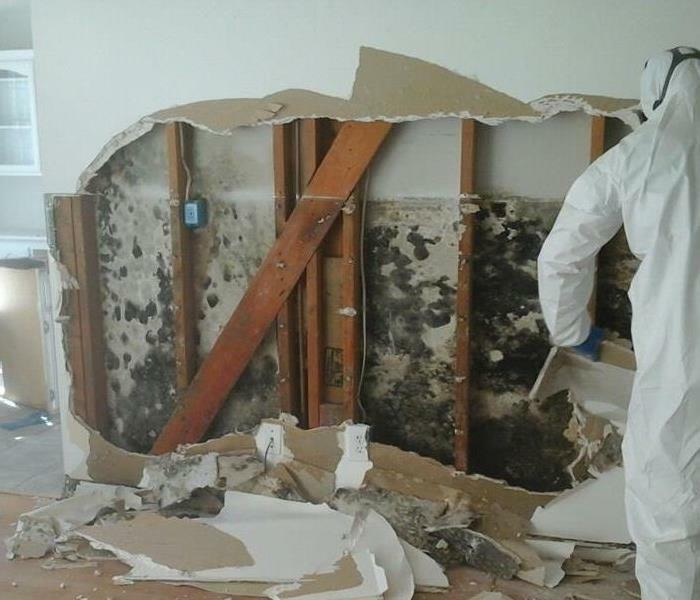 With the homeowner not taking intimidate action to get the wall dry mold quickly began to spread. 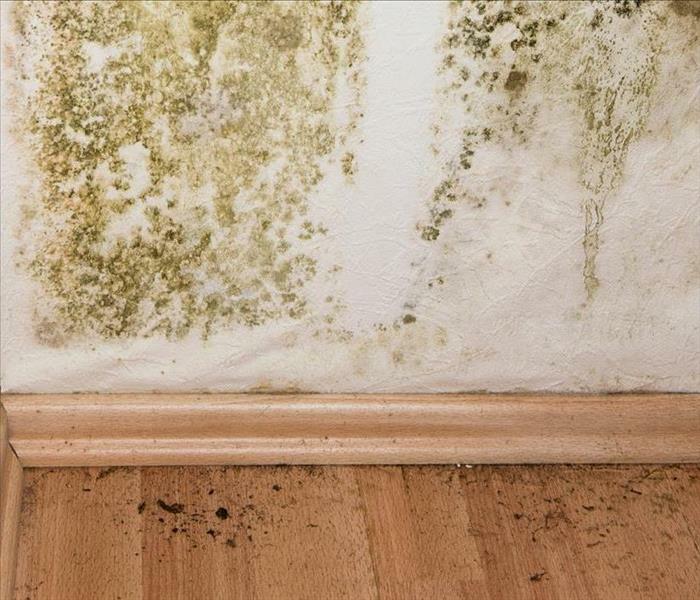 Leaving mold unattended for a long period of time can cause many types of health issues. 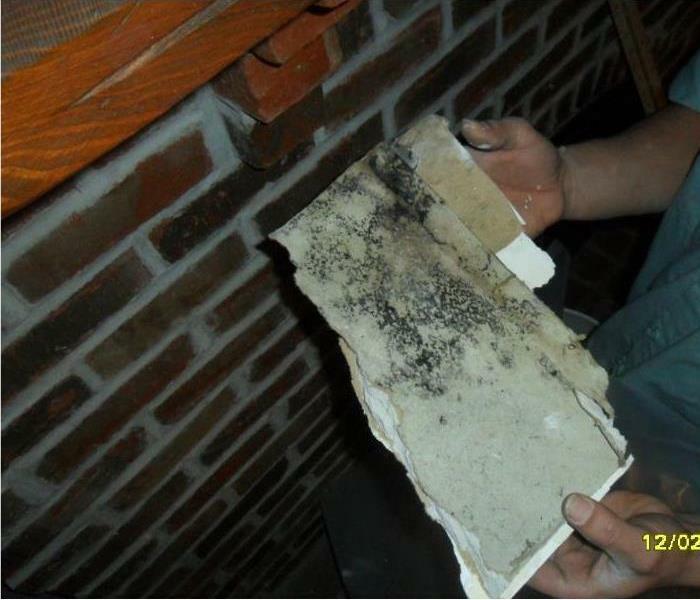 SERVPRO of Society Hill was eventually contacted to remove any mold damage, and check the air quality. The mold was cleaned up in just one day, and a follow up air test days later showed no dangerous mold spores present. Remember after any type of water damage it is very important to have it dried out right away, and properly. 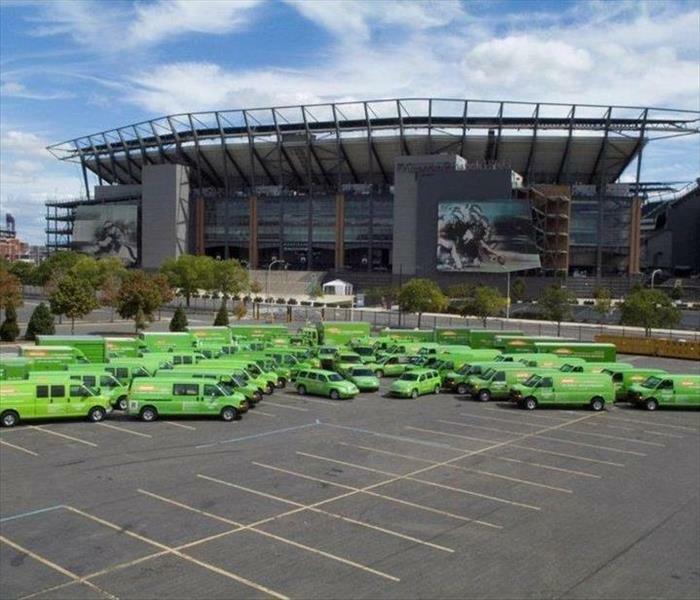 SERVPRO of Society Hill is always one call away ready for anything! 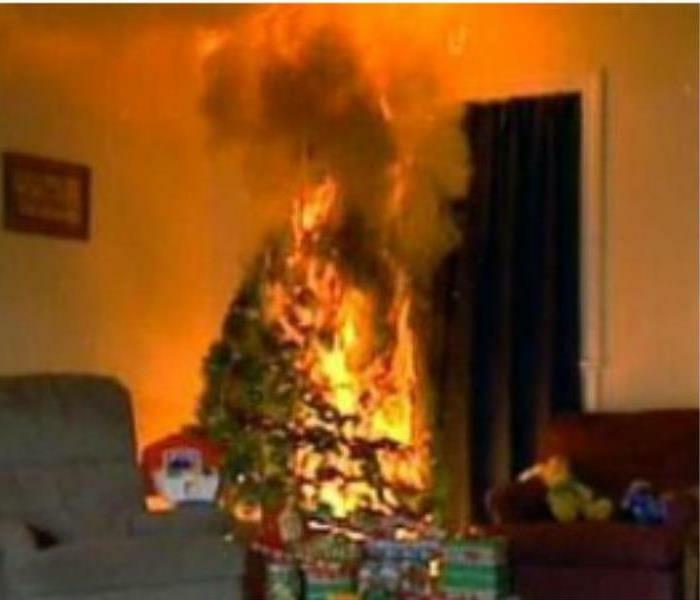 Here we have the aftermath of a Christmas tree that caught fire when a family had left the house and kept the lights plugged in on the tree. A neighbor recognized smoke coming from the house and contacted the fire company. If not for that the family could have easily lost there entire home. SERVPRO of Society Hill was called out to deal with the damage the fire left behind. Removing all the burnt walls and flooring in the area. Followed by removing the smell of any smoke and soot. The family needed a speedy recovery form the incident, and SERVPRO was able to provide them with a quick response and restoration. It is very important to be extremely careful when putting a real tree in your home. They can are huge fire hazards is not watered daily, and if placed in danger areas. Also always unplug lights when no one is around or sleeping. Any type of spark or heat source can put a dry tree into a instant blaze. This is the water damage left behind after a pipe in the ceiling of an office building burst. Here we have the saturated carpet in the break room. With all the water build up throughout the work place employees were unable to do there daily job. SERVPRO of Society Hill was on the scene within an hour of being contacted. Ready with the proper equipment to get the water out, and start the drying process. All the standing water was out within 2 hours, so at least the employees were able to start getting back to work. After 2 days of continuous drying the carpet was dry, and better than ever. 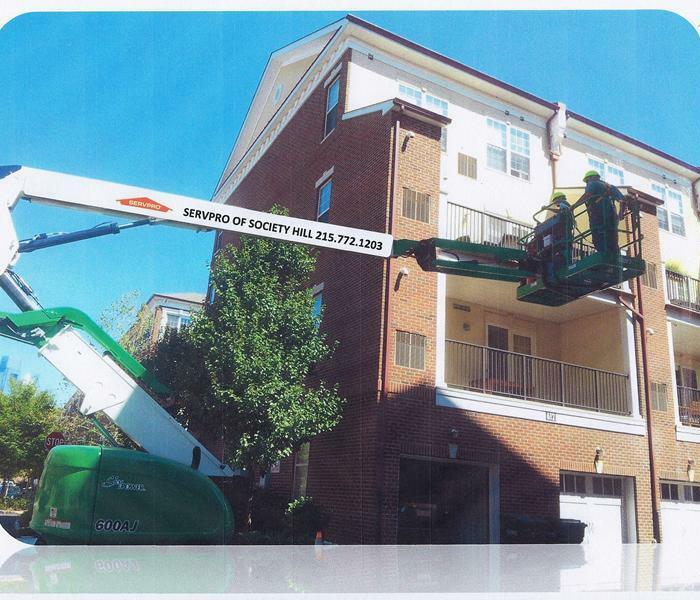 The business was very pleased with the quick work done by SERVPRO of Society Hill. Time out of the office is money lost for the employees. So it was crucial SERVPRO get the job done quickly and efficiently. Another job completed and left "Like it never even happened." 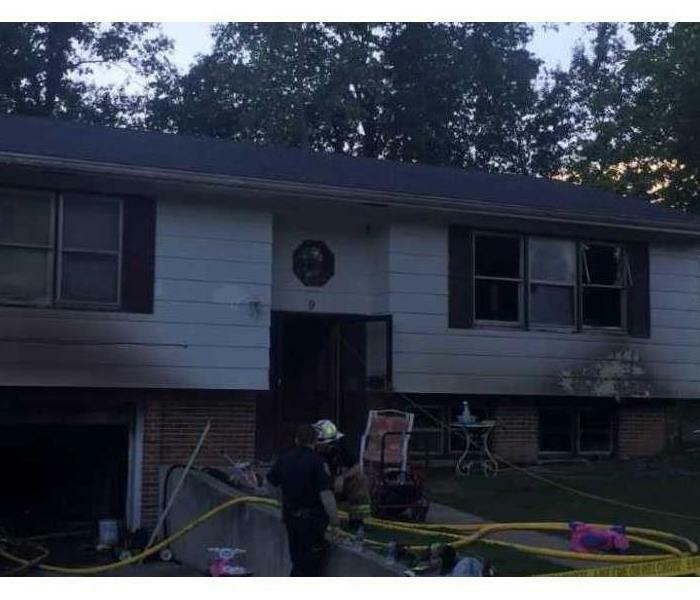 This house caught on fire by a space heater left on after the family left for the day. If space heaters are left on they have a big chance of catching on fire. Also, space heaters can catch fire if they are placed to close to any furniture or curtains in the house. The results of this house was that the space heater was placed to close to the curtains and caught them on fire. Once the curtains caught on fire the rest of the house followed shortly after. SERVPRO Society Hill was called to clean the soot and smoke damage off the walls and ceiling. The family was shocked of the results of the house. All the soot and smoke damage was cleaned up. Here we have mold growth underneath an outdoor deck. While its not uncommon for mold to grow outside. 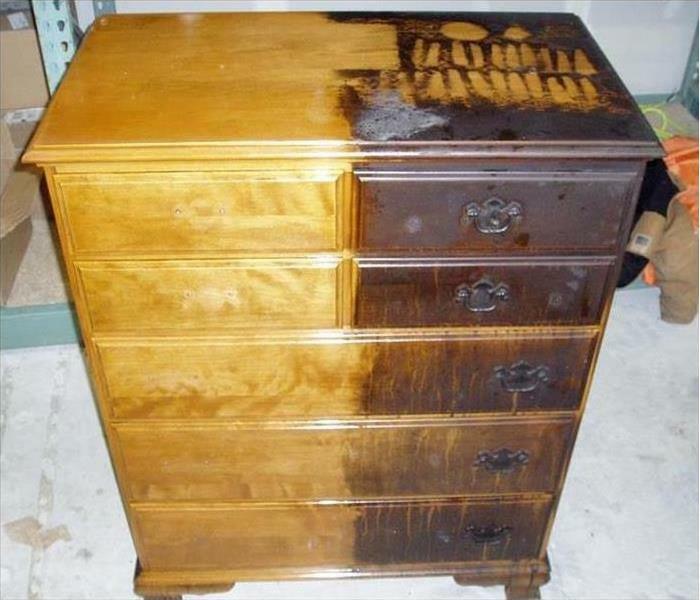 Its still not good for the wood or to nice to look at. In this case SERVPRO of Society Hill came in and scrubbed the wood with mold cleaning sponges. Followed up by power washing the rest up with hot water. Finally a new sealant was applied so that mold growth would happen less frequently and lowered the chances of mold significantly. The deck being outdoors it's nearly impossible to stop all mold growth. This being because of the moisture and always changing temperatures in the air. Also before the sealant the wood was just soaking in water. Which will cause mold to grow at a much more rapid pace. So if you're like this home owner and are finding the same issue, don't hesitate to contact SERVPRO of Society Hill to wipe that mold away. 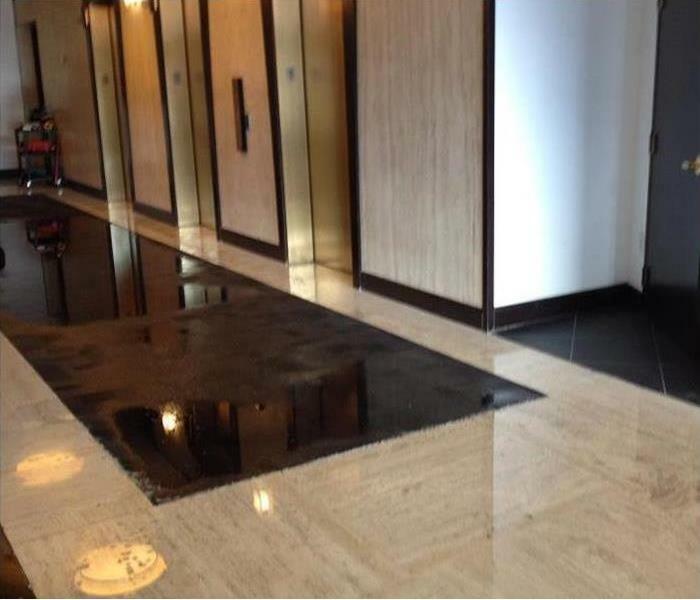 This water damage happened from a pipe bursting on the fifth floor. The water seeped through the floor damaging two more floor below. The ceiling, walls, and carpet needed water extraction. Some of the damage was non restorable and needed to be taken out. It was a big job however, SERVPRO Society Hill got the job done. The property manager was relieved that the building looks like it did before the disaster happened. This damage shown here was the result of when the homeowner forgot to turn of the stove top, and a oven mitt caught fire because it was to close. 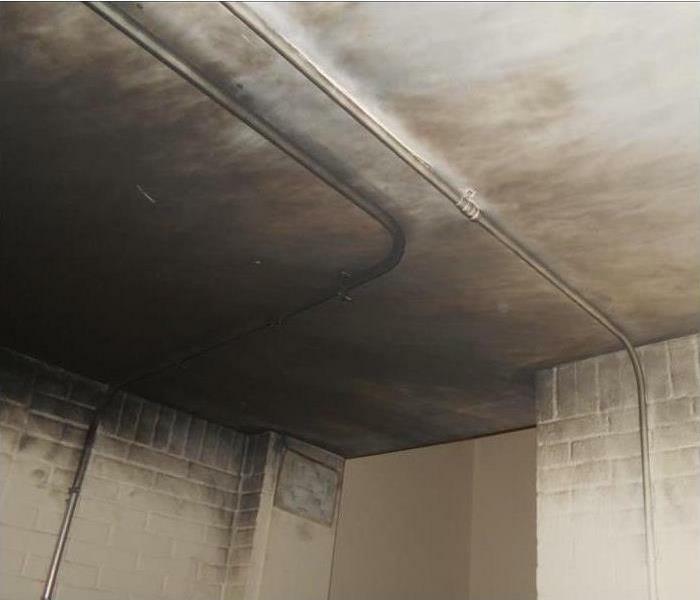 Not only was there major fire damage, but as shown here ash and soot covered the ceiling. SERVPRO of Society Hill was called out so that we could properly and effectively remove all of it. Luckily we were contacted very quickly after the indecent and the smoke damage was easily removed within a days time. 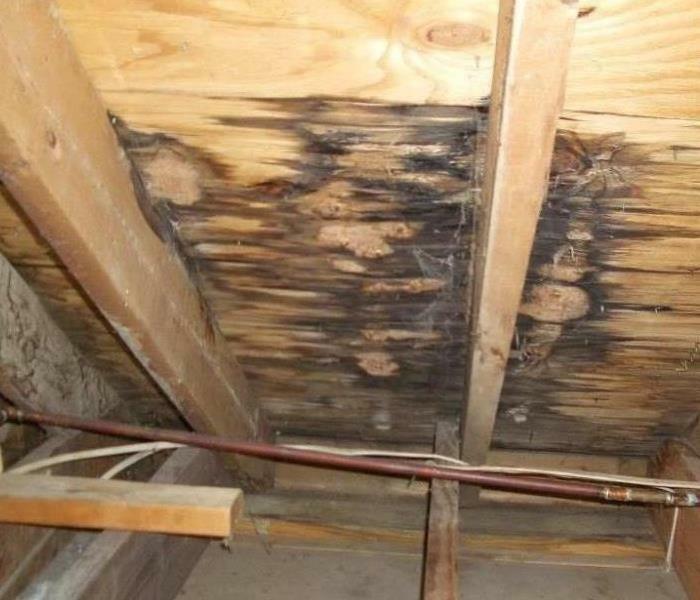 Smoke damage that is left to sit for long periods of time can result in permanent damage. The homeowner was thoroughly pleased with the cleanup results, after three quick days of extensive work. 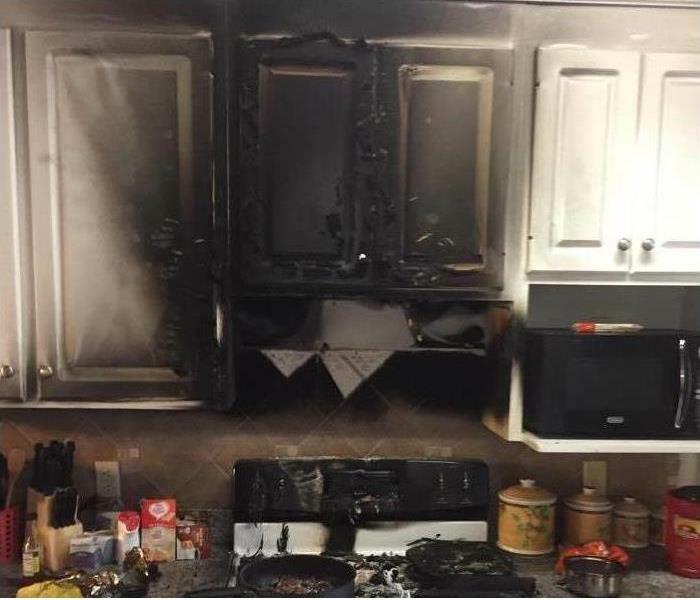 So remember with the holiday season approaching, always make sure all ovens, stoves and cooking devices are shut off when not present, or not in use. Do not let silly mistakes damage your holiday season. This tree falling was the result of a strong wind storm that rolled across our area. This picture was one of many houses that got hit by a tree. There was no panic as SERVPRO Society Hill was called to clean the mess up before any other damage happened to the houses. The customers were thrilled to see how fast SERVPRO Society Hill responded to the call. Once the crew got there they got right to work. Cleaning the trees up and restoring the houses to the way they were before the storm happened. The homeowners were delighted to see the outcome after everything was over. SERVPRO Society Hill got all the houses back to the way they were before any trees fell. Not long after hurricane Florence crushed the Carolina's. Another monster left parts of Florida and Georgia absolutely crippled. With the rapid growth of the storm and lack of preparation time. No one was ready for the destruction Michael left behind. In times of these terrible disasters, SERVPRO is ready to get out there to help restore the affected areas. We know it will take a lot more then just SERVPRO to get people back to living conditions, but any relief is a step in the right direction. That's why if people can come together from all over to help in the relief cause. It will only be a matter of time before the South is back on its feet! 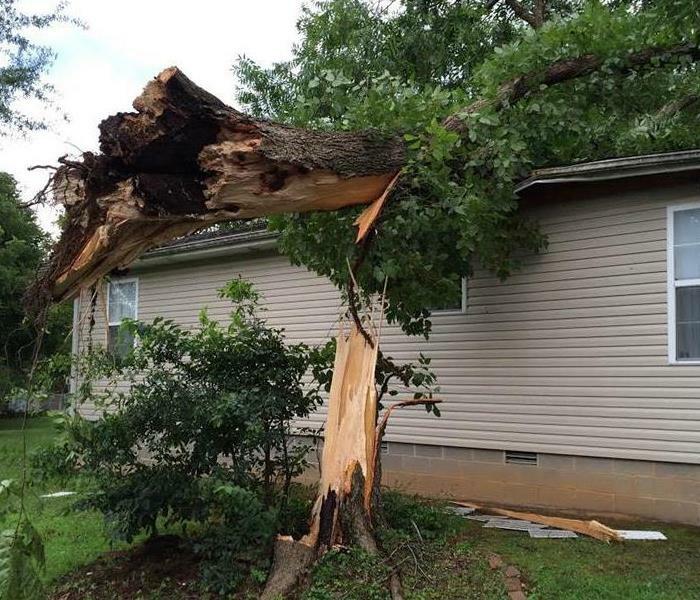 Here we have a tree that fell into a house after a severe storm rolled through the area. Causing significant damage to the homes roof. This problem needed to be taken care of right away. There was a breach in the roof which could bring more problems to the inside of the home. SERVPRO of Society Hill was quick to the scene once we received the call. Getting right to work so that there was no further damage that could occur. 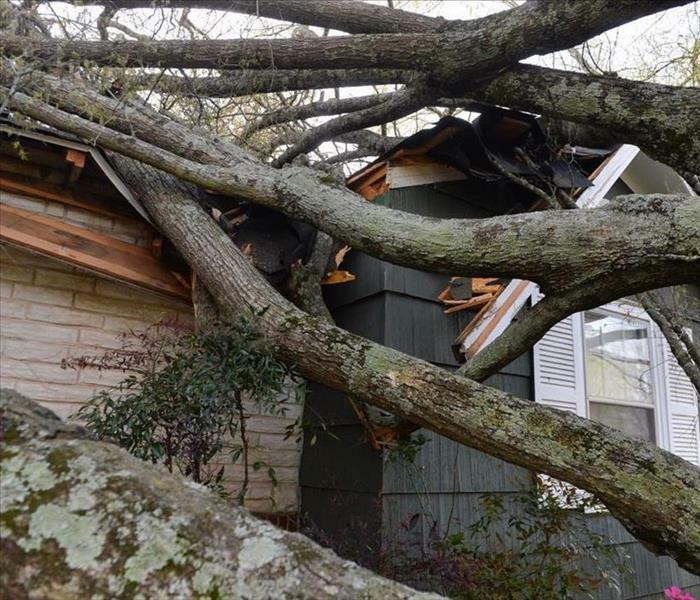 The home was at risk for more water damage since the tree had broke through the roof. After the tree was removed the roof was fixed, and the small amount of damage inside the house was taken care of. 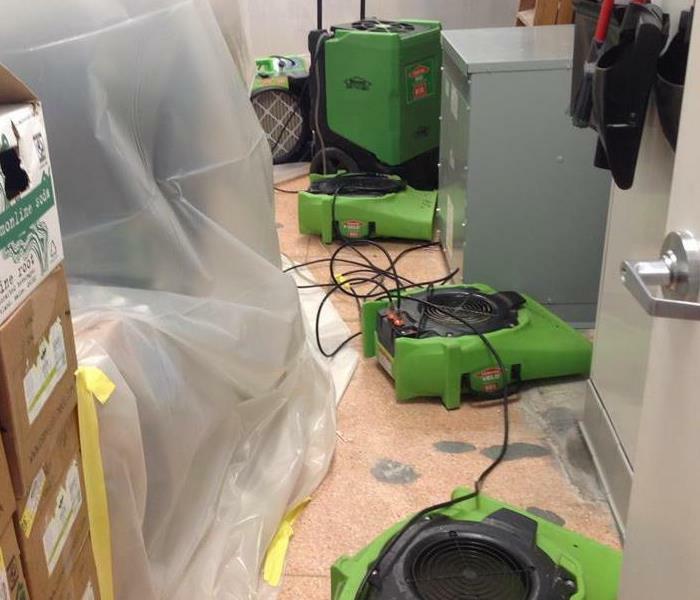 SERVPRO can't stop the storms or the damage they can bring, but we can clean up any mess no matter the size! The fire damage shown in the picture started from the hot water heater. 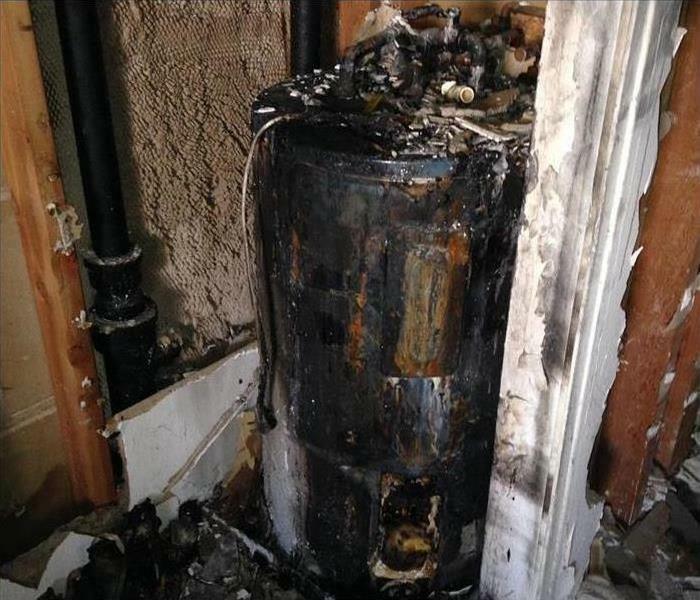 The homeowner was shocked to find that the hot water heater started the fire. SERVPRO Society Hill explained to her that hot water heaters are a common way that fires start in houses. There was significant fire damage that happened in the basement of the house. The entire wall behind and around the hot water heater was destroyed and needed to be replaced. SERVPRO Society Hill got rid of the fire damage that needed to be taken out also, they cleaned the smoke and soot damage that the fire left. SERVPRO Society Hill also got rid of the smell of smoke. 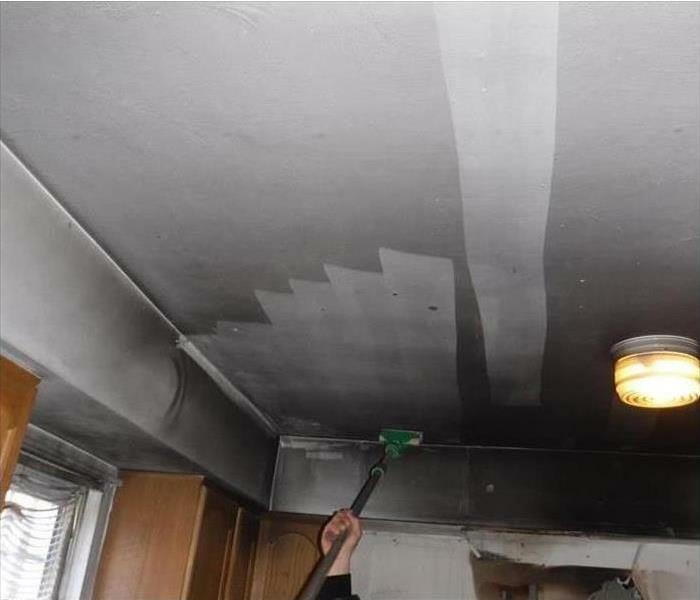 The homeowner was extremely happy with the results. Here we have the destruction a fire left behind in a family's home. While not all was lost, the level of damage sustained was high. 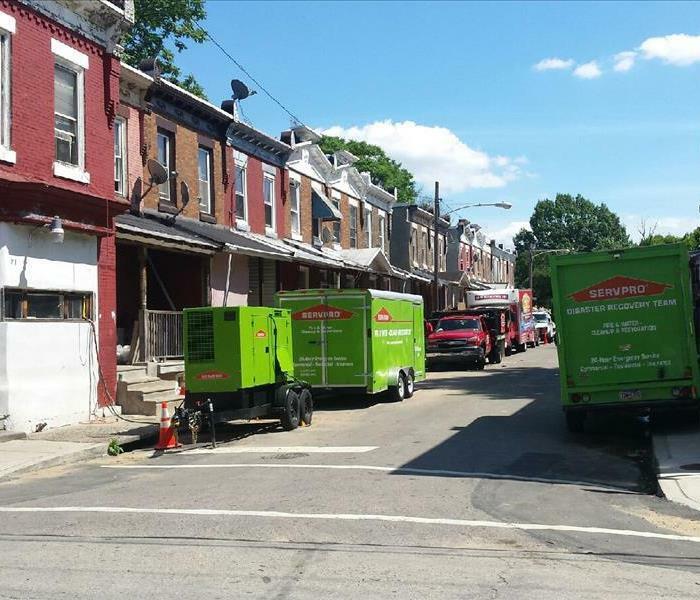 SERVPRO of Society Hill took action right away. Came in and started the demolition process. While some walls could be scrubbed clean of the smoke and soot damage, others were beyond repair. When this is the case the walls must be removed and replaced. 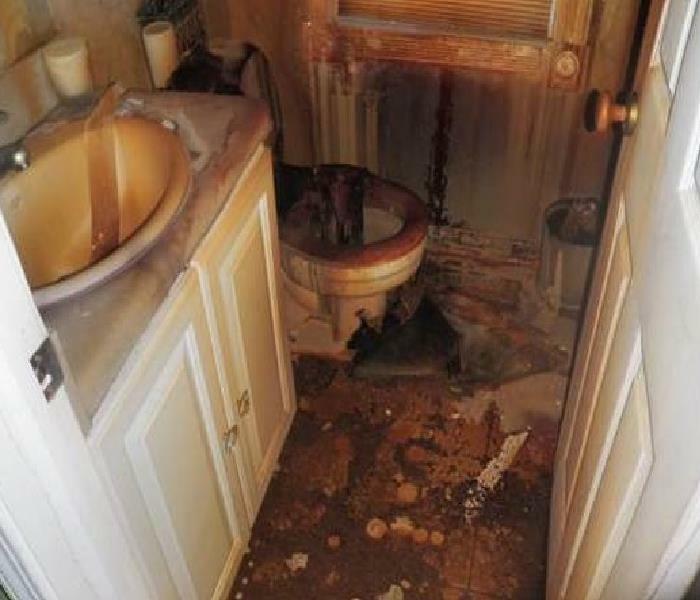 SERVPRO is fully trained in removing the fire damaged areas, and cleaning up any mess. If the wall can be cleaned, no problem we have all the cleaning supplies to remove soot and smoke areas. The damage in this photo was extensive and took a little over a week to complete, but the home owners were beyond pleased with the finished product. 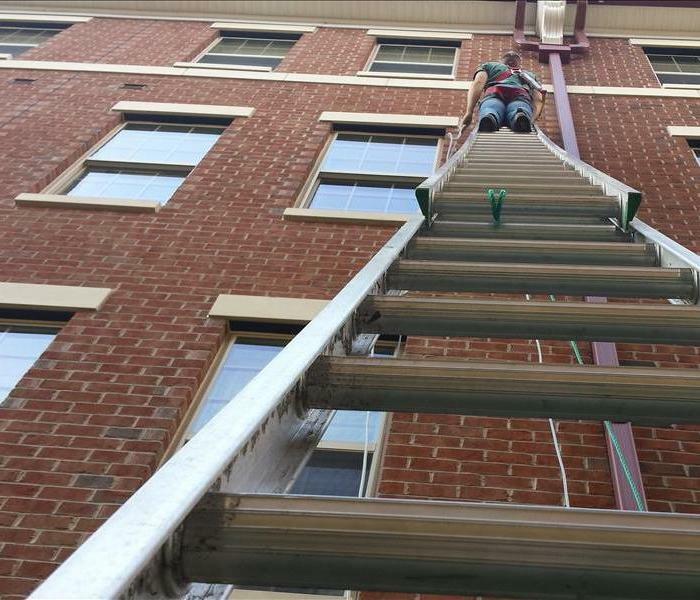 SERVPRO of Society Hill came in and made a difficult fire damage "Like it never happened." This is the aftermath of a leaking roof. The roof on the exterior of the house was missing shingles. Whenever it would rain it would sink into the wood roof. This resulted in water damage and mold damage. The homeowner finally noticed the mold and called SERVPRO Society Hill, once the crew got there they assessed the damage and treated the area that had mold. They treated it by spraying the mold so it doesn't spread to the rest of the attic. 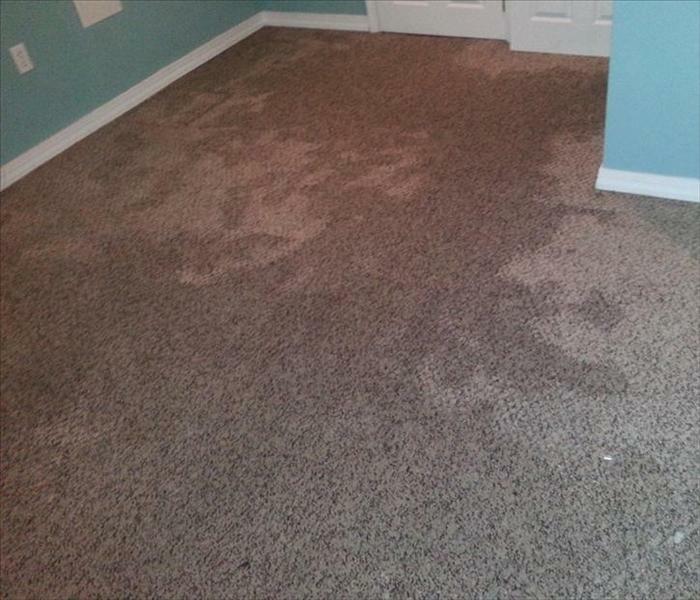 The homeowner was very happy to see the results after the job was finished. SERVPRO Society Hill made it seem like it never even happened. 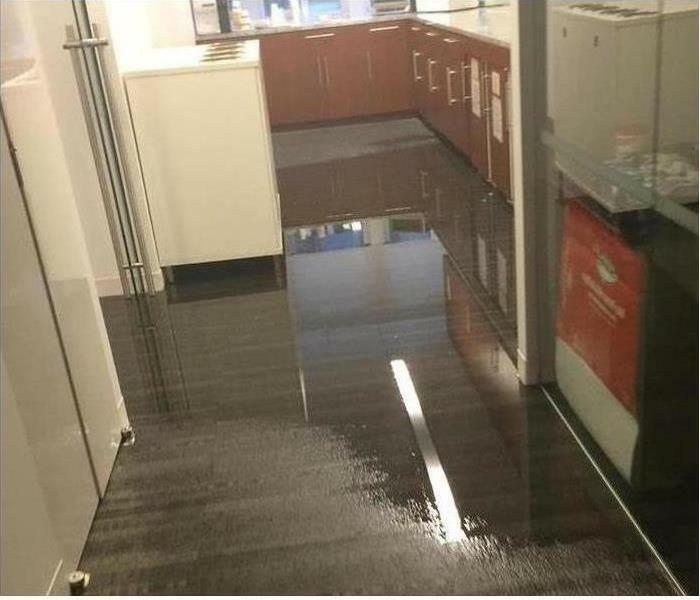 This water damage happened from the sink over flowing and spilling onto the floor. The homeowner said that she turned the sink on to thaw food out for dinner. The homeowner then forgot that they left the sink on. Then, she left to go do something else. When she returned the kitchen was filled with water. SERVPRO was called and cleaned up the water and the damage that the water left. The damage shown here is the result of a washing machine malfunction. Water damage affected the floor and walls beneath. Carpet had to be Pulled so that the floor beneath could be dried out along with the carpet. The bottom parts of the walls suffered from some mold growth and had to be taken out. After four days of drying out the water affected areas, the home was ready for repair. 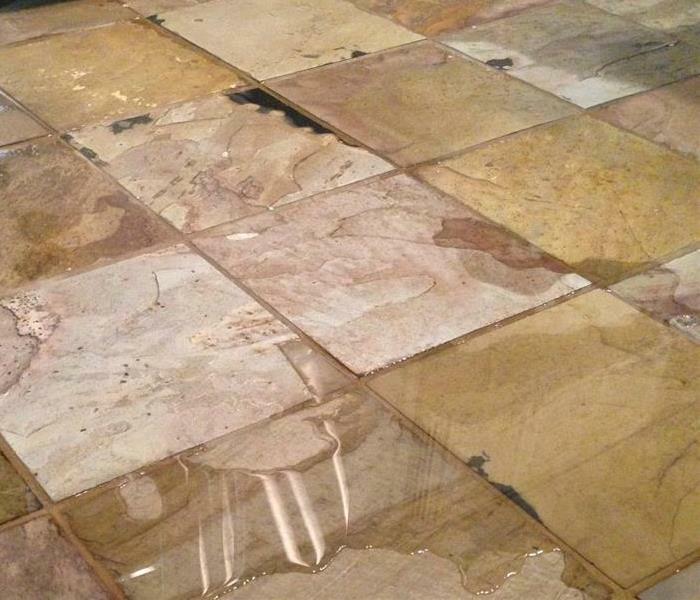 SERVPRO of Society Hill was able to clean up this water damage properly. Leaving another fully satisfied customer with a damage that looked "like it never even happened." This is all the smoke and soot buildup in a basement after a house fire. As you may know fires not only can destroy things bye burning them. Smoke and soot damage can be just as bad. 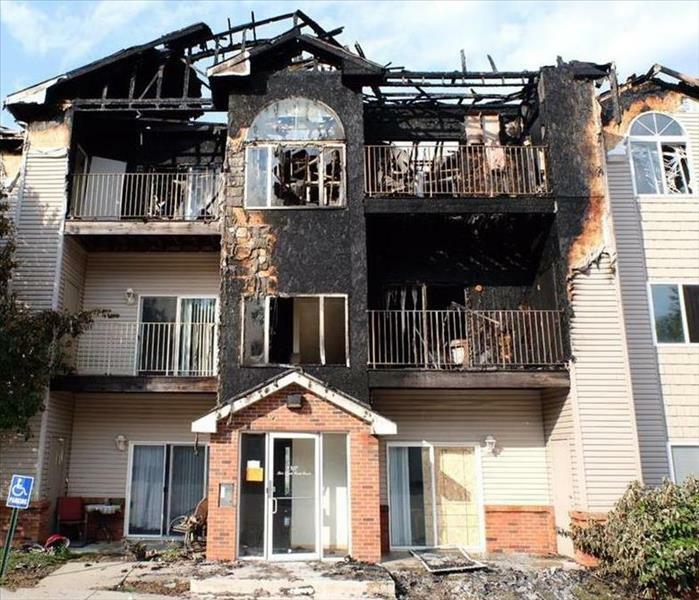 Unlike the burnt down property, smoke and soot damage can be restored! SERVPRO of Society Hill was able to turn these walls back to there original white color in just two days work. Which is good news for the owner, because leaving soot to sit around is a health hazard. Also the longer smoke and soot remain on a surface the harder it will be to clean. So its crucial after a fire to take action quick, and get that soot out! This is what a historical building looked like after it was tagged by vandals. Graffiti isn't just a problem in the city limits it stretches all over the world. An graffiti is not something you can just wipe away an be done with. It takes proper procedures to be able to remove it. 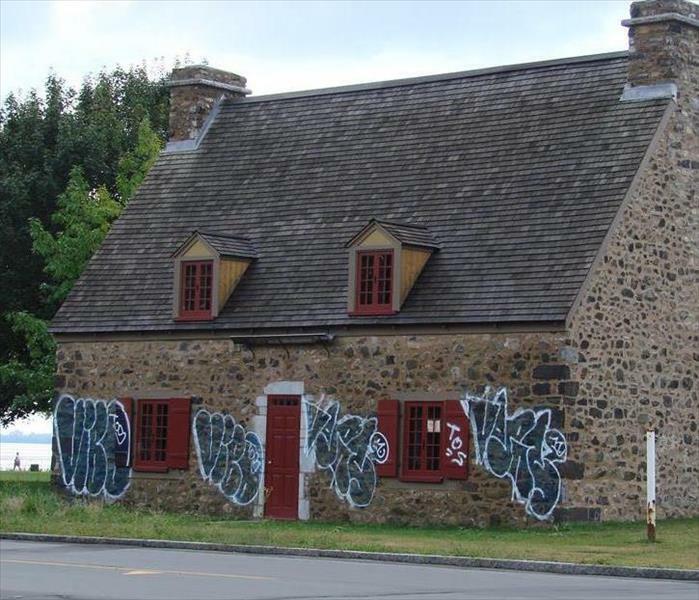 SERVPRO of Society Hill has all the right cleaning tools, an supplies to remove any size graffiti vandalism. Whether your in the city or the suburb. SERVPRO can leave your building, home, or property "Like it never happened." This is the aftermath of a fire starting in a apartment complex. The fire was started in the kitchen of one of the apartments. The fire then spread to the other apartments destroying every apartment that was connected. When these apartment complex catch fire it is hard for firefighters and personnel to put out the fire before it spreads further. Therefore, this is the usual result of a apartment complex fire. However, when these disasters happen SERVPRO will be there to help clean up and restore the fire damage to usual. With this homeowner not taking care of their mold problem right away it spread to majority of the room, which your seeing in this picture. For mold to spread it releases spores, which can spread through air, water, or on animals. When mold spores are produced it can spread throughout a room and even throughout a house. But, SERVPRO can handle any mold job from small to big. Our team will eliminate the mold so that it will look like the mold wasn't even there. A fierce storm caused a tree to fall through this apartment complex. Causing some flood damage and debris to enter the building. After the storm had passed an the damage was done. SERVPRO of Society Hill was contacted to clean up the mess. Removing the flood water an debris from the apartment that was hit with the tree. Whenever a storm leaves your property damaged. Just know SERVPRO is a call away from cleaning up any size mess! Thanks to this homeowners toilet backing up an flooding the bathroom , a quick cleanup was needed. Calling SERVPRO of Society Hill was crucial and smart decision that was made. 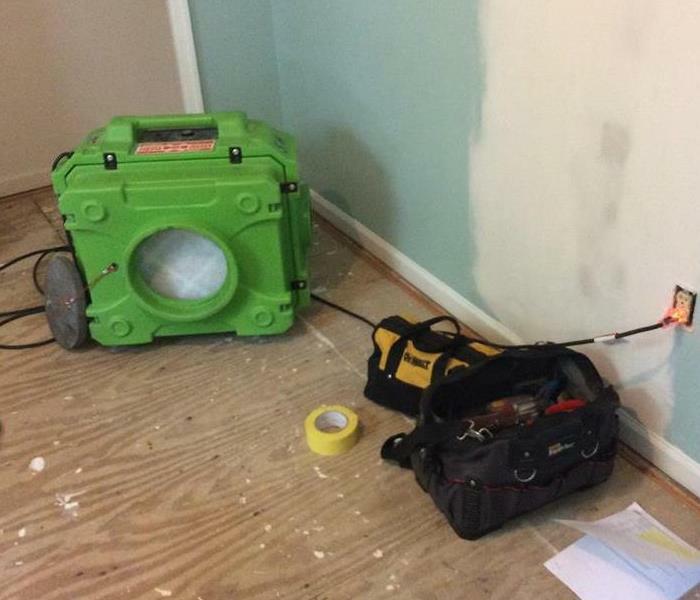 SERVPRO was able to make it to the site very quickly, and because so was able to save the bathroom from further water damage. Removing the water an properly drying the bathroom prevented any mold growth which would have been a whole bigger problem. So anytime you're toilet decides to overflow, or something goes wrong in the bathroom. SERVPRO of Society Hill is ready to clean up the mess. 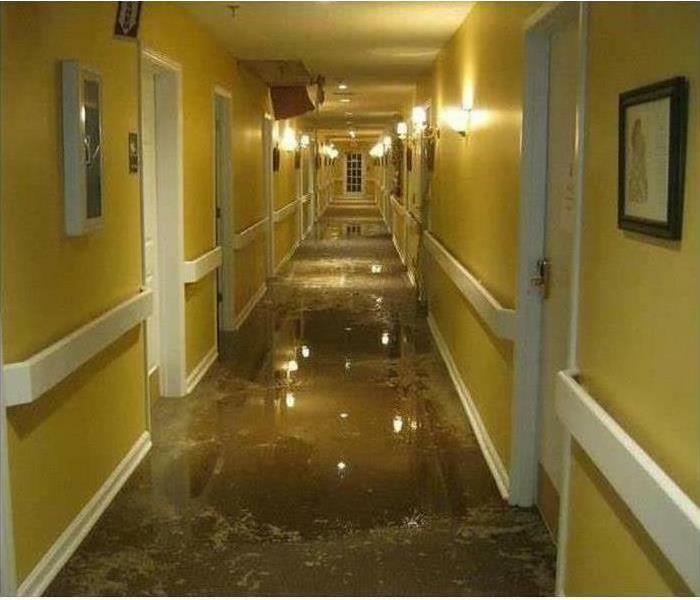 After three full days of non stop rain, this hotel was hit with a flood in their front lobby. With competing hotels right around the corner. This problem needed to be fixed immediately! With one call to SERVPRO of Society Hill. The restoration was under way within the hour of the call. Quick response, an the proper equipment the flood water was extracted in no time at all. The hotel was extremely pleased with the work that was done. With the quick call and response from SERVPRO The hotel was able to stay open, an keep filling their rooms with customers. If mother nature punches you. SERVPRO is always ready with the counter punch! There isn't a job that we cant handle, an leave it looking like nothing ever happened! 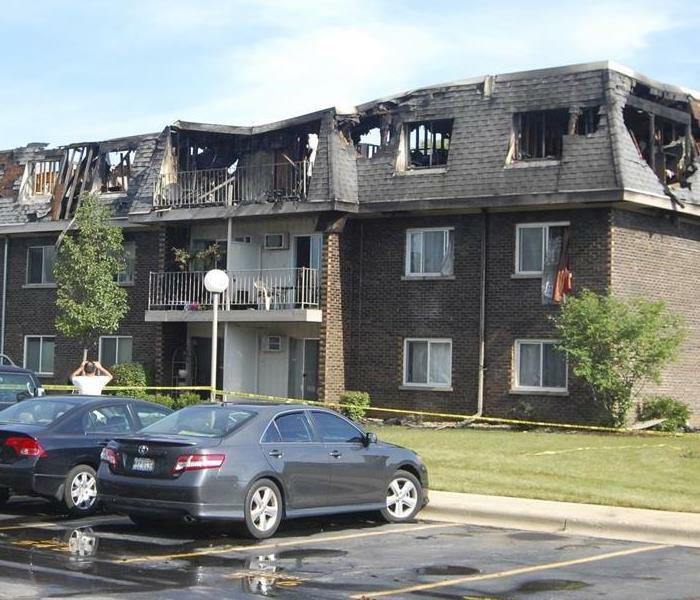 This was the aftermath of an apartment complex fire. The apartment buildings show significant damage. Projects like these take a lot of time to recreate what was there. That is why everyone should choose SERVPRO for damages like this. SERVPRO would accomplish the job to recreate the same building as it was. SERVPRO strives to make every project like nothing even happened. Oh No! Mold Strikes Again! After a pipe burst in this home mold damage was inevitable! The homeowner was out of town for a few days an had no idea that the pipe had burst. Not only was it causing water damage, but mold soon started to appear! Mold is not something to take lightly. It can cause many health issues, such as, nasal stuffiness, coughing or wheezing, throat, eye, and skin irritation. 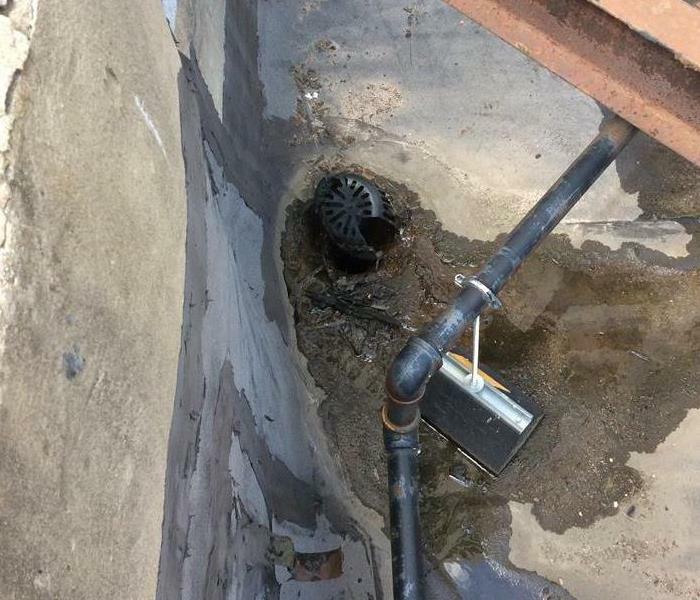 Luckily the homeowner contacted SERVPRO of Society Hill as soon as they returned home an became aware of the problem. We were able to respond quickly, an properly cleanup the water damage followed by extracting the mold infested areas. It is very important to get rid of mold at the first site of growth! 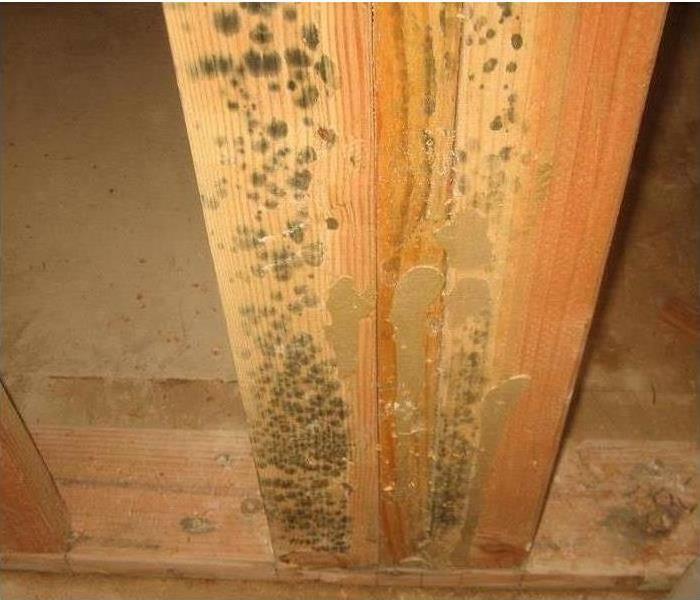 The dangers an affects grow worse the longer mold is left unattended. 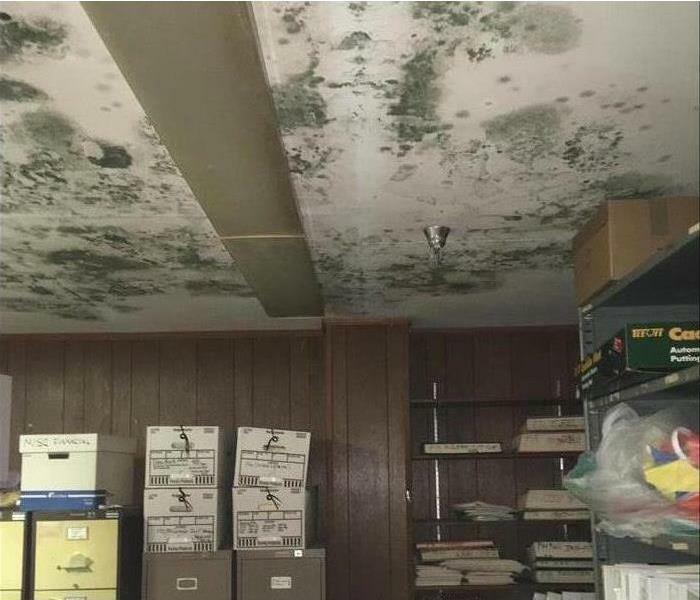 Don't put your health in jeopardy when SERVPRO is one call away ready to kick that mold out! After the winds have died down, and the rain has stopped pouring. 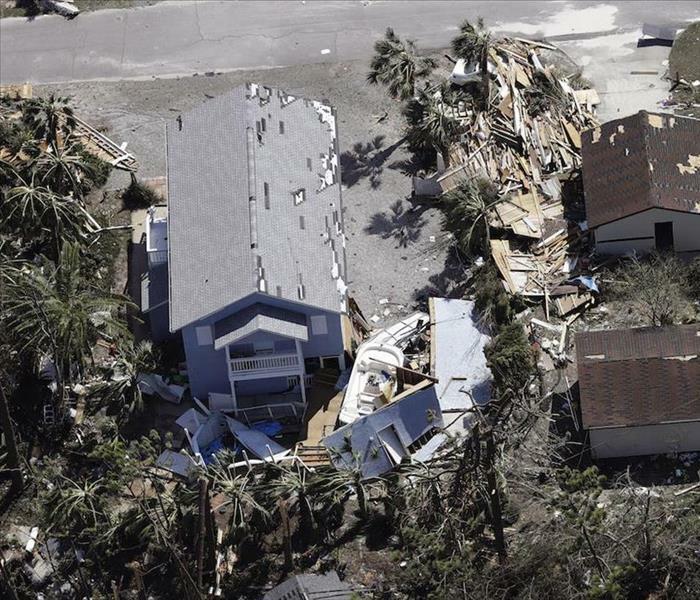 There's never any predicting what kind of damage your house or business may have taken from the latest storm! When you are affected from a violent storm, SERVPRO of Society Hill is always prepared to step up an take on troubles you are facing. 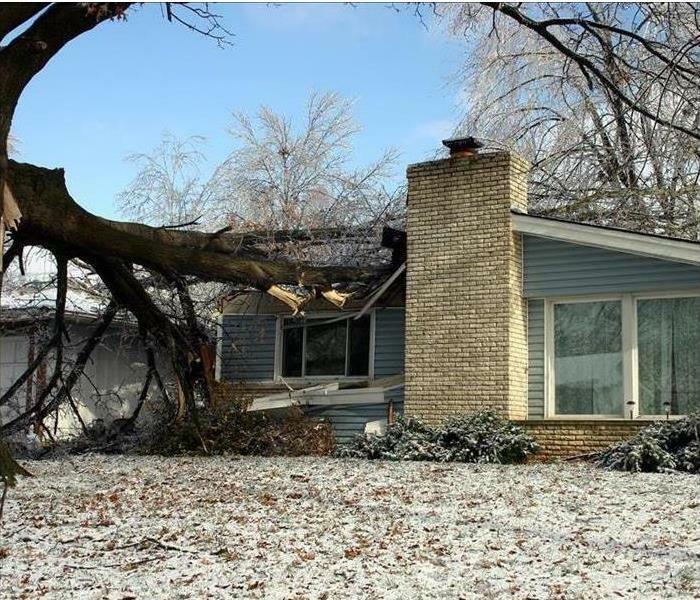 A tree crashing through your home doesn't just mean structural damage. It can also cause rain to flood your home, or even worse produce dangerous mold. At SERVPRO our quick to respond crews are ready to ship this water out, and remove any mold that may have built up. We may not be able to stop mother nature, but we sure can fix the mess she leaves behind! One of the most common places for a fire to occur in a home is the kitchen. 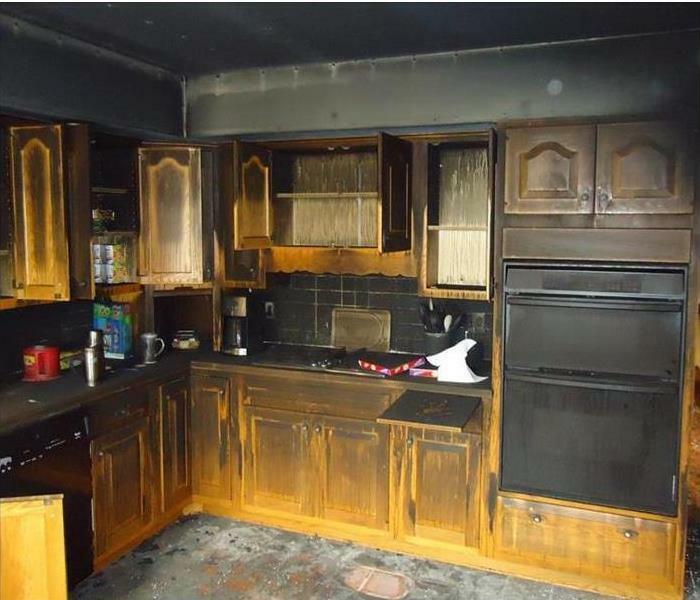 Open flames,gas,grease, and human error could all factor into sparking a kitchen fire. No matter the size or damage a fire may cause, SERVPRO of Society Hill is one call away. Ready to restore your kitchen to have you cooking again in no time! Accidents can happen at anytime, an that's why SERVPRO is always prepared to come fix them! We all know a home flood can be devastating, but what can be just as crippling is a flood at your place of business. Just one day of being shut down from flooding could be a huge loss for business owners an employees. 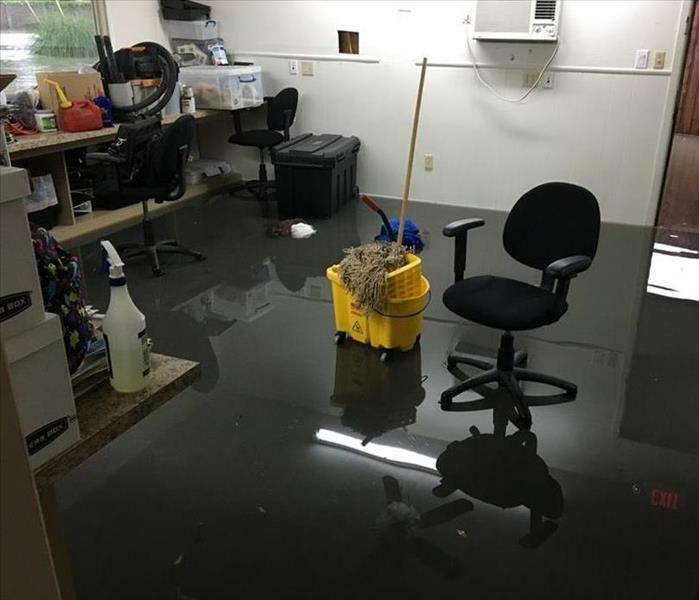 Our job here at SERVPRO of Society Hill is to get your business back up an running in no time at all, and leaving no trace of flood damage. The extent of damage after a fire and after the fire department has put out the fire is a big event for any homeowner. For SERVPRO it is not a problem at all. Call the professional to handle any of you fire and water damages. When the high wind from a storm hits the shingles from the house fly off causing the roof to be exposed to the natural elements. 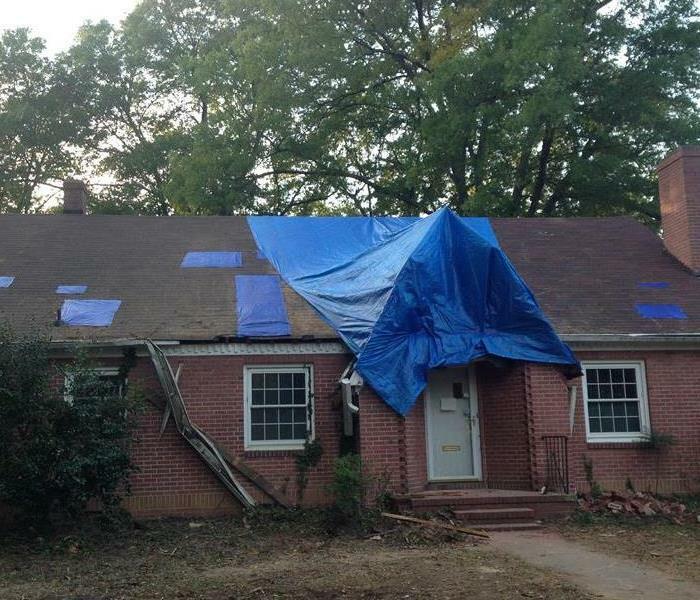 The possibility of leaks and mold growth can happen if the roof does not repair immediately or at least tarped. 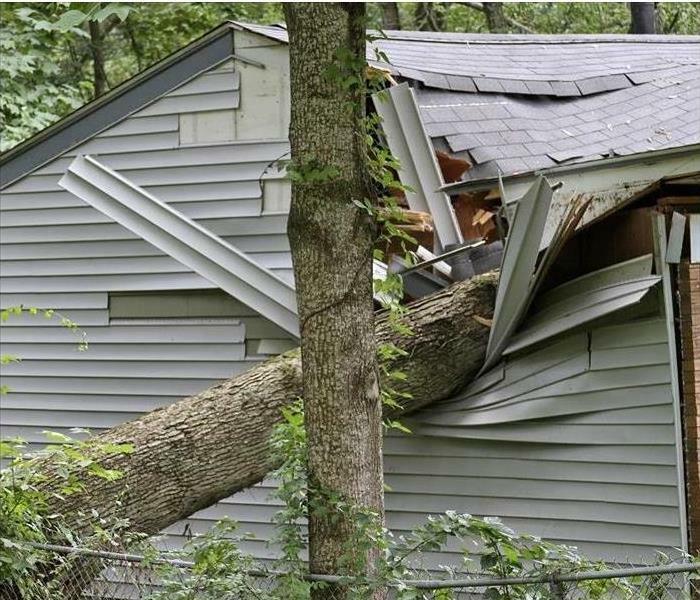 Rely on SERVPRO of Society Hill to assist in any damage repairs after a storm hit your home. Flooding is a common thing in the area especially after several days after non-stop rain, and the ground is very saturated. The effects of constant storms are the possibility of a flooded basement. Call SERVPRO of Society Hill at any time to quickly clean and dried up the basement to prevent damage belonging, structural damages and mold. Not only we are the experts in cleaning up after a fire or water damage, but we also assist when in cleaning up after a severe storm, hurricane or any other big natural disaster. 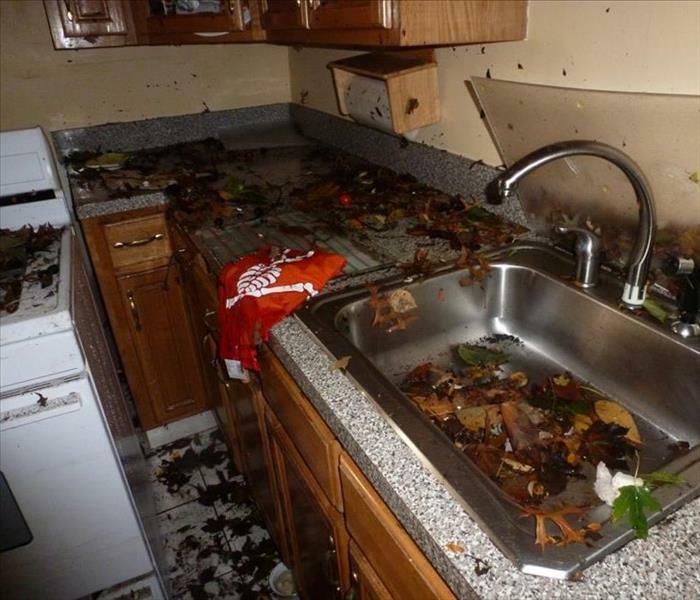 Rely on SERVPRO of Society Hill to help clean and support with any insurance claim. Ever feel sick or smell an odor out of the original? Well, you may have mold growing in your home. Here at SERVPRO of Society Hill we can perform mold testing and provide you remediation that can help you and your family be happy and healthy. SERVPRO of Society Hill is the best in mold remediation. Does not matter in what area in the home will remove areas and treat of mold infestation. 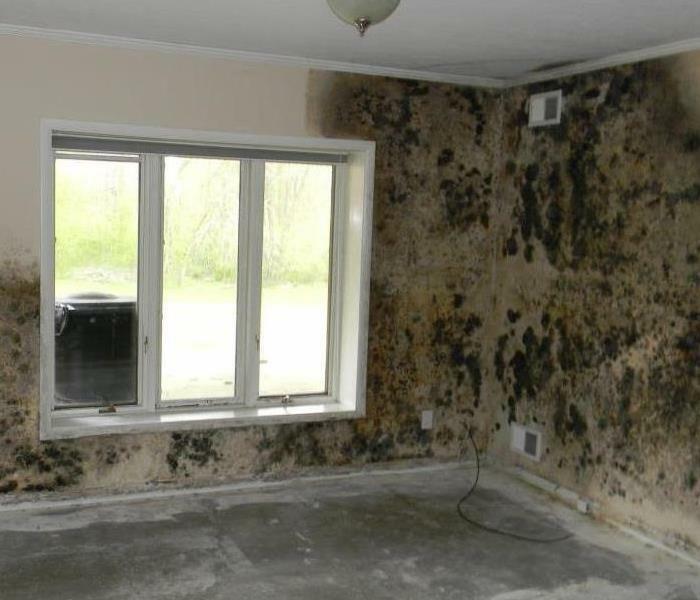 Never have to worry about the danger of mold in your home with use handling it. House fires are a miserable thing to happen to a homeowner. The homeowner can rely on SERVPRO of Society Hill to help restore their kitchen back to normal and take your worries away. Restorations Masters of SERVPRO of Society Hill are proud to restore all your personal belongings after a fire. We are here to assist you with all your needs in your hardest times. We are the number one leader in clean-up and restorations in residential and office buildings. When a property manager has an tenants with fire damage or water damage issues we are the ones they call on! We love helping the community in any water or fire damage! 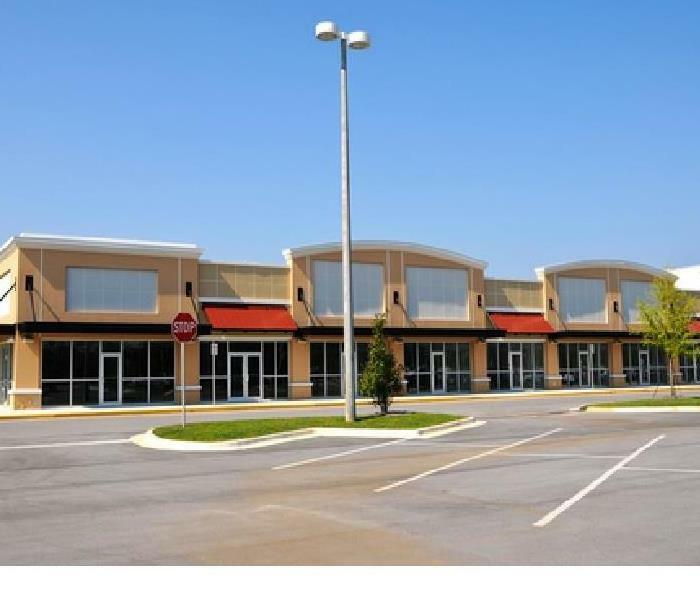 Will assisted in any facility, store, or restaurant in a strip mall! Restorations and Clean-up is what we do in helping the business save money and time. This is a mold remediation we had to perform from a burst pipe under the kitchen sink. We went in and found there had been water sitting behind the wall for over a week with visible mold. Instead of taking chances we removed the area that had the mold and replaced it with new dry wall after scrubbing it with a wire brush and vacuuming. We sprayed an anti microbial over top and sealed it off. 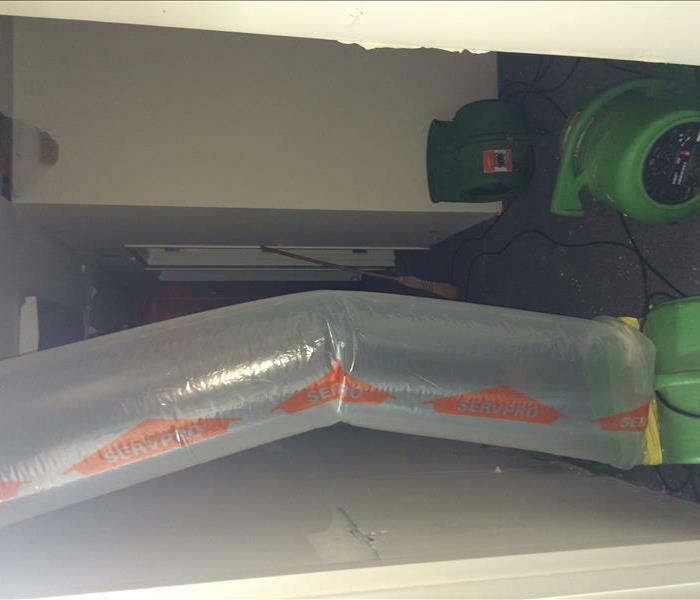 Here is a photo of our air scrubber doing its job and sucking in any open mold spores that could be hazardous to your health. Here in Philadelphia a Storm can pass through and cause problems if you are already dealing with an old roof. Make sure to be on top of these issues and always call SERVPRO of Society Hill. This is the after math of a damage when we arrived on the scene. 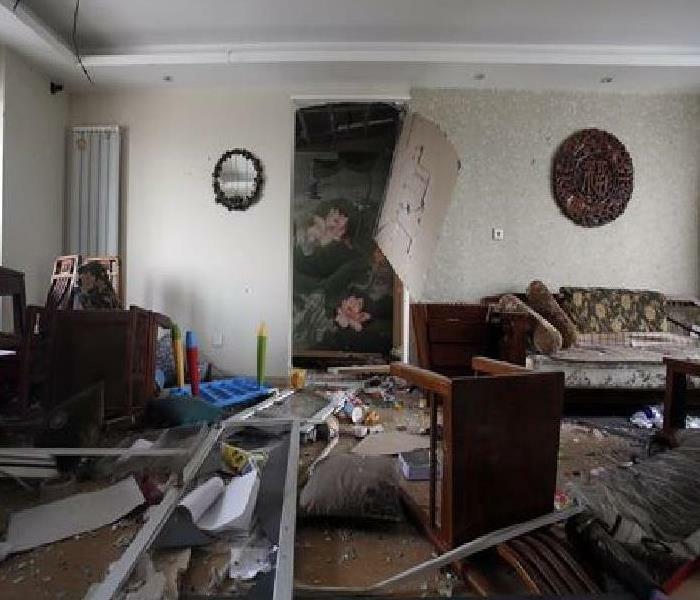 We understand here at SERVPRO of Society Hill how devastating it is to see your home look like this and that is why we are here to make it look like it never happened. we work hard to ensure your home is back to normal with our trained staff and state of the art equipment to repair something like a collapsed ceiling for example in no time. 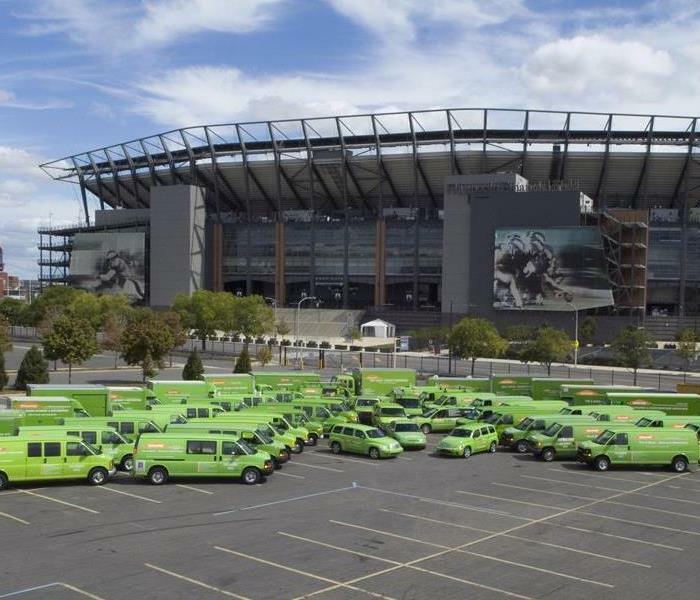 We are excited to announce that we will be doing hydrating hero's at SERVPRO of Society Hill once again this year. A time where all the local franchisees get together in Philadelphia and donate hundred of cases of water to our first responders to show our appreciation for all they do for the community. Here is a picture of our fleets ready to make our rounds and supply to our local heroes! SERVPRO of Society Hill attended a meet and greet at Naval Sqaure. We got to meet and talk with the residents at Naval Square in more detail about our services. SERVPRO of Burlington/Mt Holly finished up at Second Baptist Church in New Jersey. The flood affected two floors of carpet based offices and hallways. SERVPRO of Society Hill has had a crew working on Creighton Street due to a water main break that occurred Sunday June 7th. Our crew has been assigned to six houses with basements flooded up to the kitchen steps submerging resident's contents in mud and water. 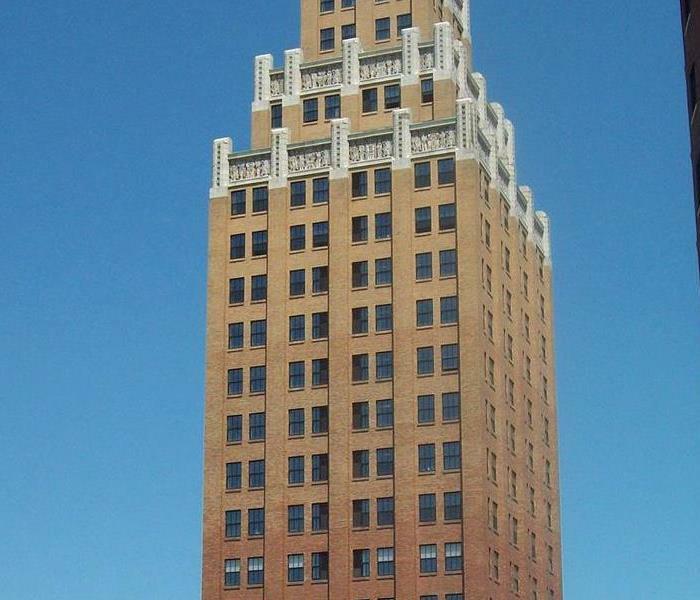 SERVPRO of Society Hill now has a office on Society Hill Towers property at 2nd and Locust. Please feel free to drop by or call for a brochure or any questions you have regarding how SERVPRO of Society Hill can be of help for any commercial or residential space. This was the result of heavy flooding in Manayunk Philadelphia, PA. This storm hit quickly and flooded many homes and cars with mud and water. SERVPRO responded and helped restore units. 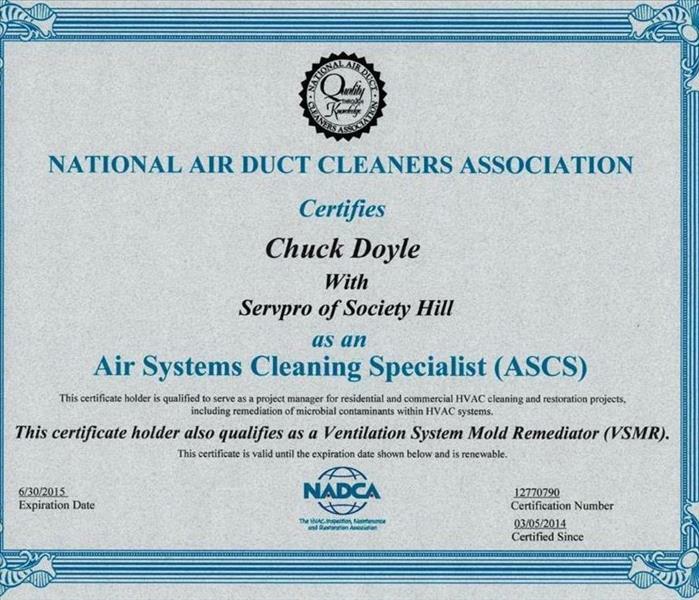 We are certified under the National Air Duct Association as a Air Systems Cleaning Specialist. Please contact us with any Duct Cleaning questions or needs. 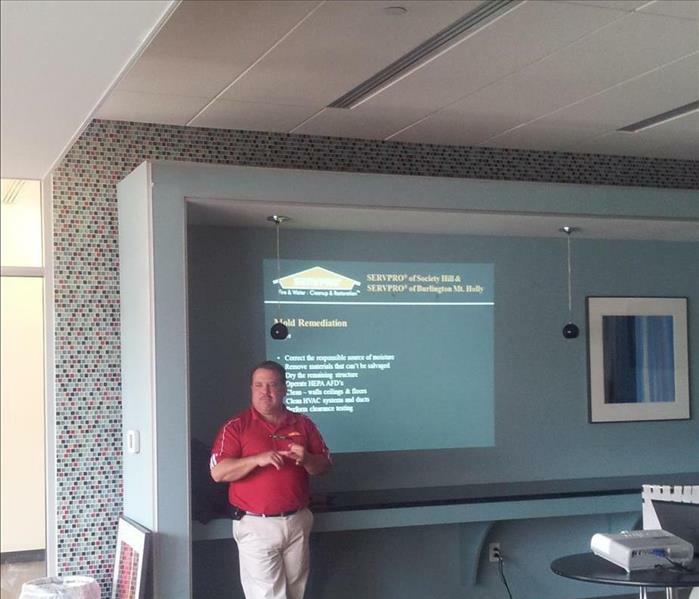 This Education Seminar was held in Philadelphia at our clients property. We provided lunch and gave an overview of Water, Fire and Mold Damages to the Engineers! Thank you again for allowing us to provide this seminar. This is our booth at the 2013 GPHEA tradeshow - we had a great time talking to both vendors and engineers! Thank you to the GPHEA for allowing us to participate. The Home Depot on Columbus Blvd in Philadelphia arranged this Fire Prevention Workshop. 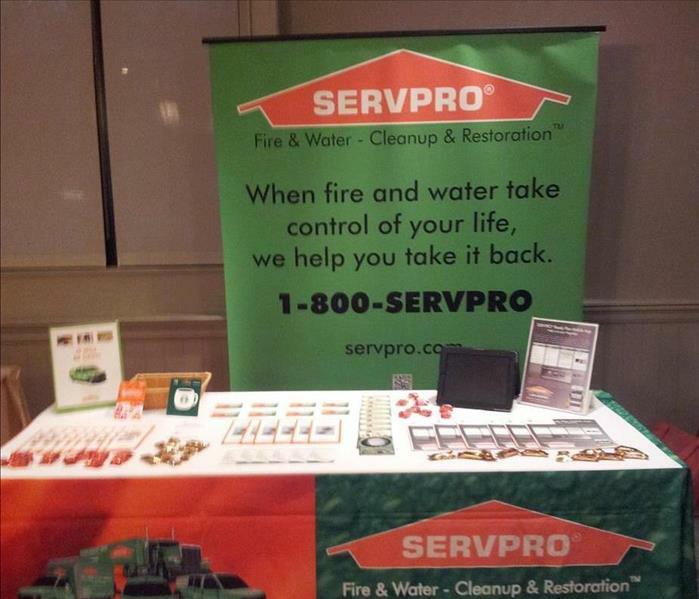 SERVPRO of Society Hill was proud to participate along with the Philadelphia Police Department, the Philadelphia Fire Department and Peco. 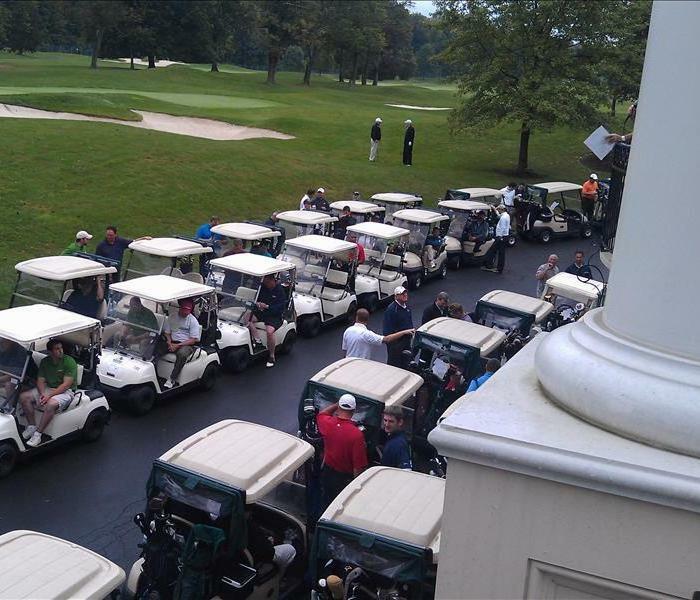 The SERVPRO Philadelphia Regional Franchises and guest enjoyed a wonderful golf outing on Monday September 16th at Commonwealth National Golf Club! As always, SERVPRO is committed to providing the highest standards of excellence to businesses and homeowners in the communities we serve. All proceeds from this event will be presented to the Foundation to continue their tradition of excellence in Alzheimer’s care, education and research. This was the aftermath of a pipe leak in Philadelphia when we arrived on the scene. There was a significant amount of standing water. The owner was impressed with our response time and how quickly we were able to clean the water damage up. We made it "Like it never even happened." A ventilation system is often the biggest culprit in poor indoor air quality, inspecting the ductwork should be a high priority. Dirty ducts can circulate odors, contaminates such as mold and irritating dust. 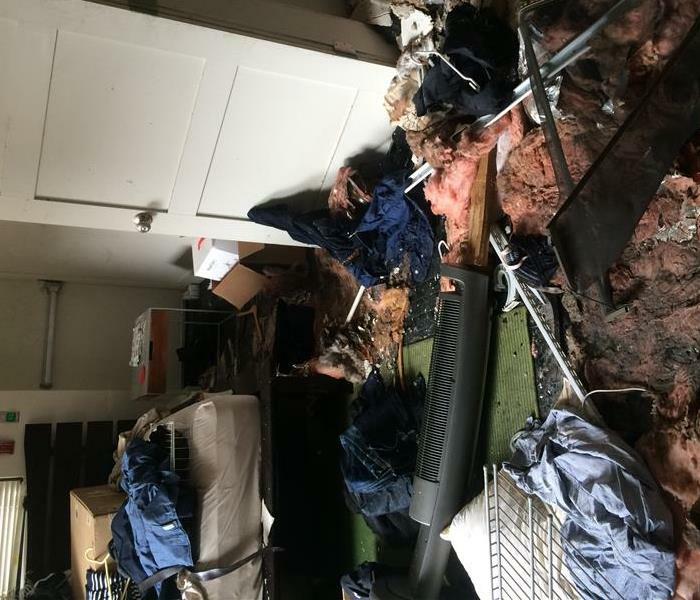 This was the aftermath of heavy rain flooding a basement in Philadelphia, PA. This cleanup was required for contents removal and disposal. We extracted the standing water from this basement and cleaned and sanitized the floor. 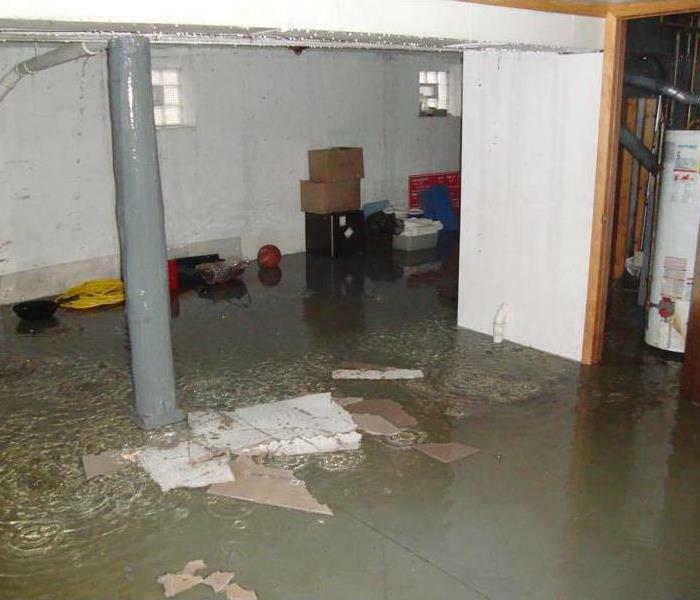 If you have a flooded basement call our professionals! Due to moisture in a residents home SERVPRO of Society Hill crew inspects and handles everything that needs to be completed, starting at the top of stairs and continuing throughout the basement. SERVPRO performed as intense carpet cleaning at Rancocas Valley Regional High School in Burlington NJ with a large focus on gum removal. SERVPRO of Society Hill completed a full carpet cleaning at Rancocas High School including upholstery cleaning and all the drapes before the kids return to school. 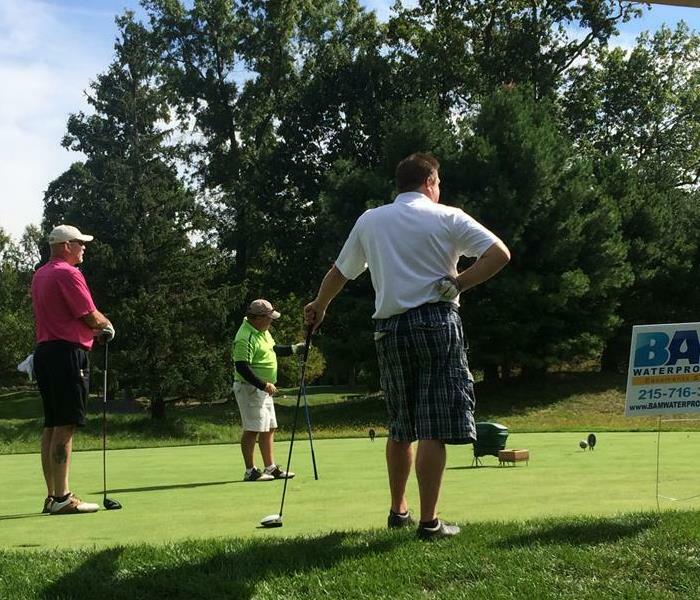 SERVPRO hosted their 7th Annual Golf Outing, franchises invited great clients to spend the day with. Successful day of golf ended with some giveaways and dinner. Thank you for all who attended ! !